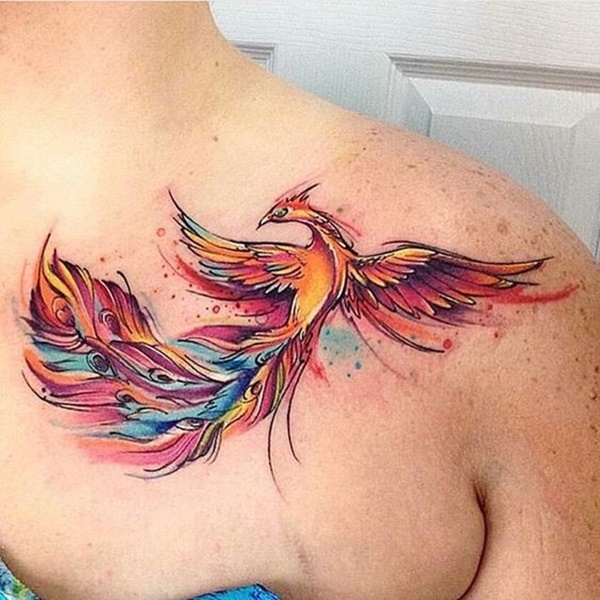 Replicating watercolors in a tattoo requires a skilled artist that is adept at color distribution. 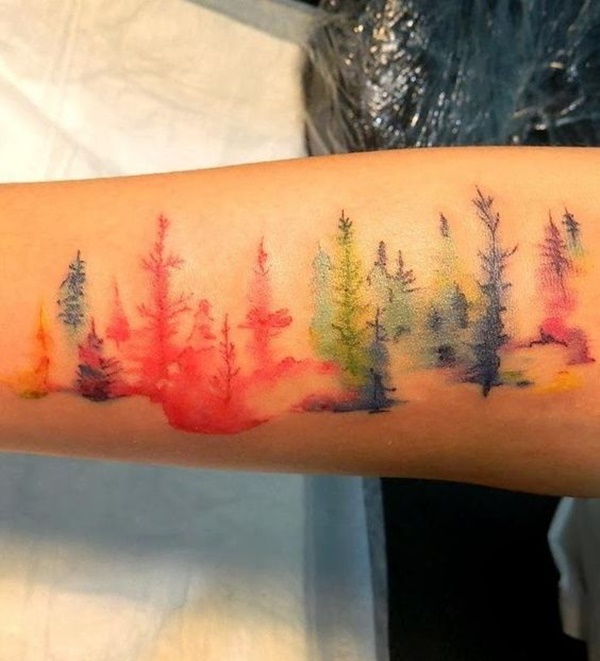 In this article we explore 100 watercolor tattoos that expertly reproduce the difficult medium. 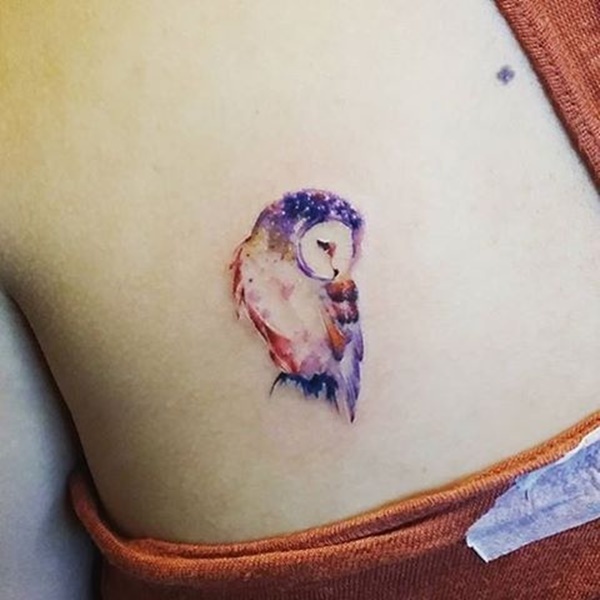 Whether the subjects are abstract or strikingly life-like these images will help you to identify a well-done watercolor tattoo from a poorly inked impostor. 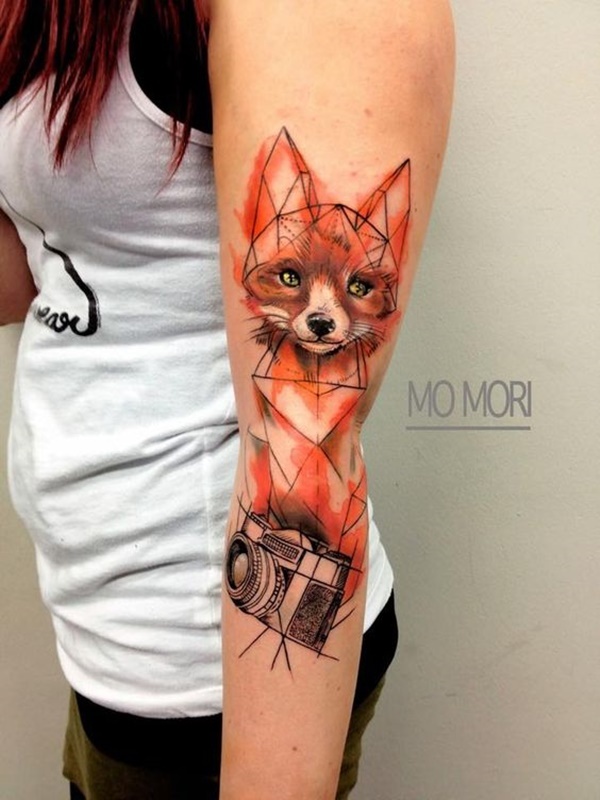 A fox is comprised of geometric shapes and colored with orange ink distributed in a manner to replicate the delicate smears of watercolors. At the base of the image an analog camera is rendered in a palette of black and gray. 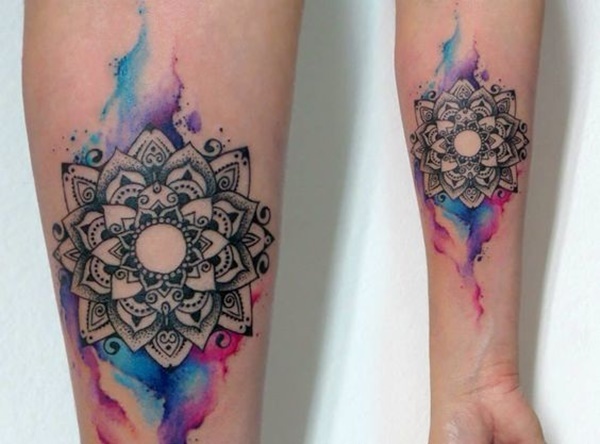 A black and gray mandala is accented with blue, purple, and pink watercolor smears above and below the piece. 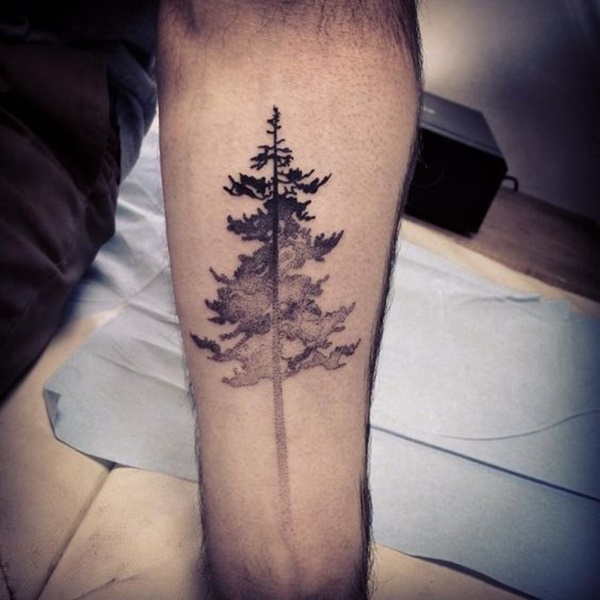 The silhouette of a pine tree is darkest at the top and becomes increasingly lighter toward the bottom of the image. An owl is depicted with its head turned in this animal portrait. A delicate purple is used to color the head and tail of the bird while reds, yellows, and oranges are used to accent the body. 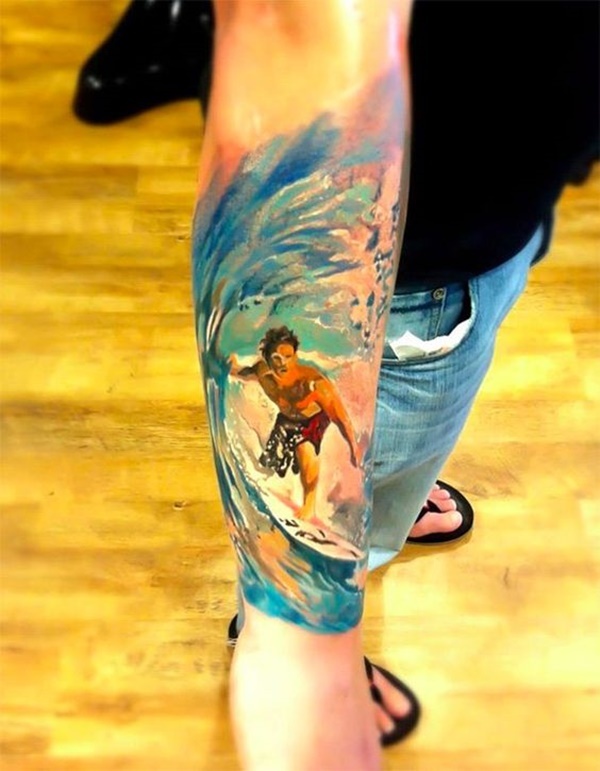 A surfer is depicted under a cresting wave in this incredibly well done tattoo. The distribution of color does a magnificent job of separating the subjects while maintaining the reflective qualities of the water. 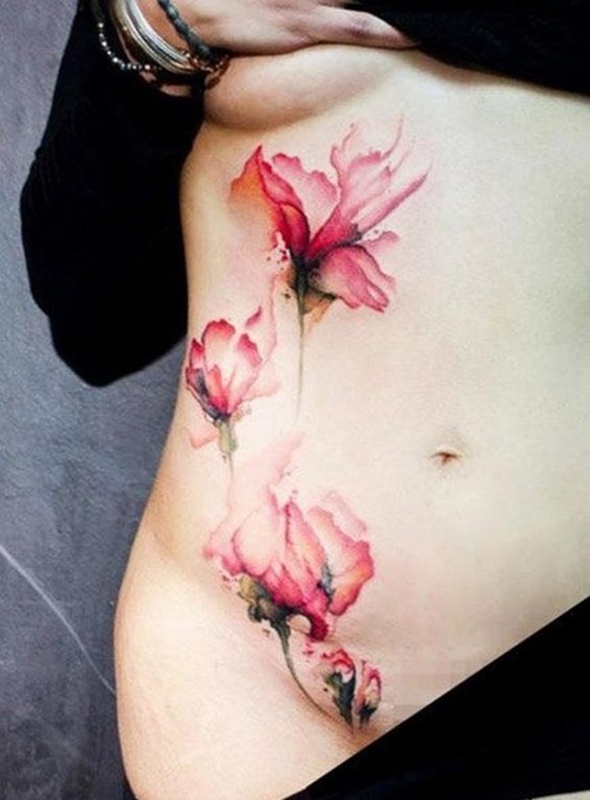 A flower in full bloom is accented with a smear of red and purple watercolors. 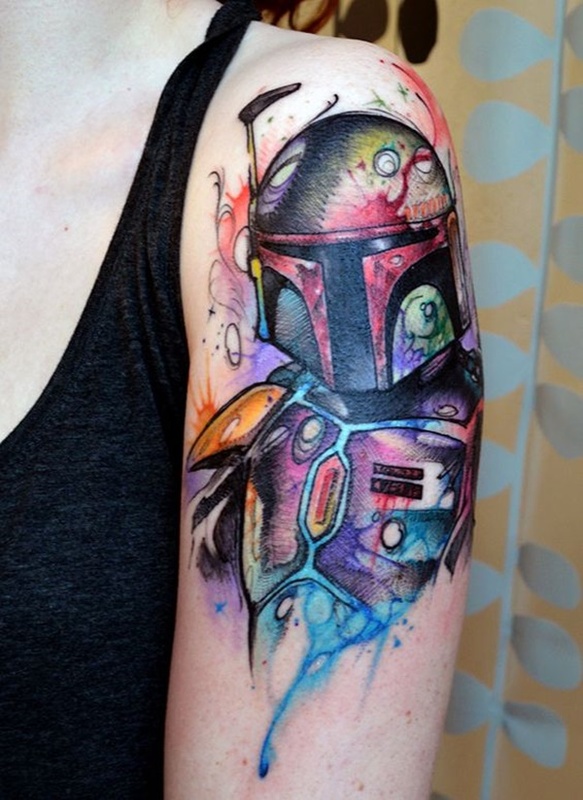 A portrait of notorious intergalactic bounty hunter Boba Fett of the Star Wars universe is colored with a vibrant array of watercolors. 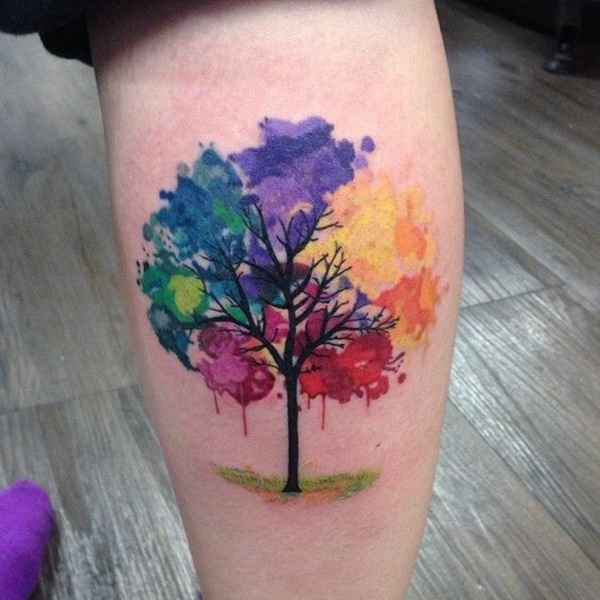 This tattoo does a great job of utilizing the runs synonymous with watercolors. The water remains reflective and textured throughout the drip of blue while the sun is rendered using negative space surrounded by orange and paint splatters. 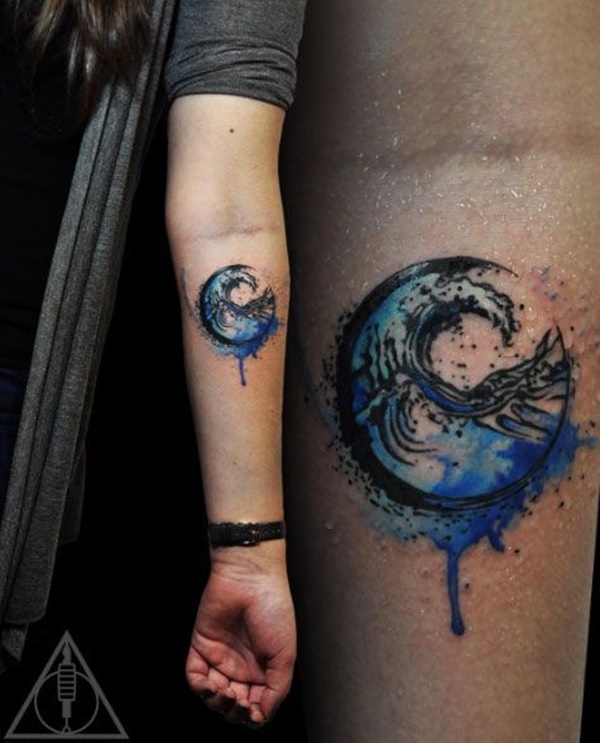 The centerpiece of the tattoo is an impeccably well drawn sailboat featuring the silhouettes of two people. 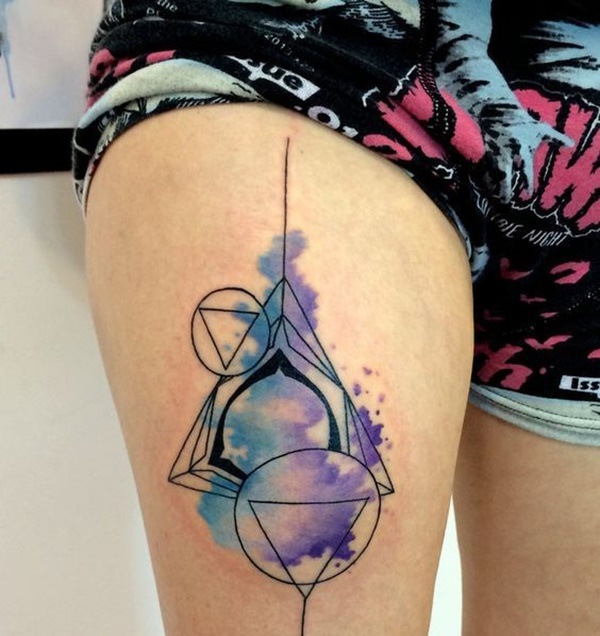 A series of geometric shapes including triangles and circles overlap one another and are colored with smear of blue and purple watercolors. 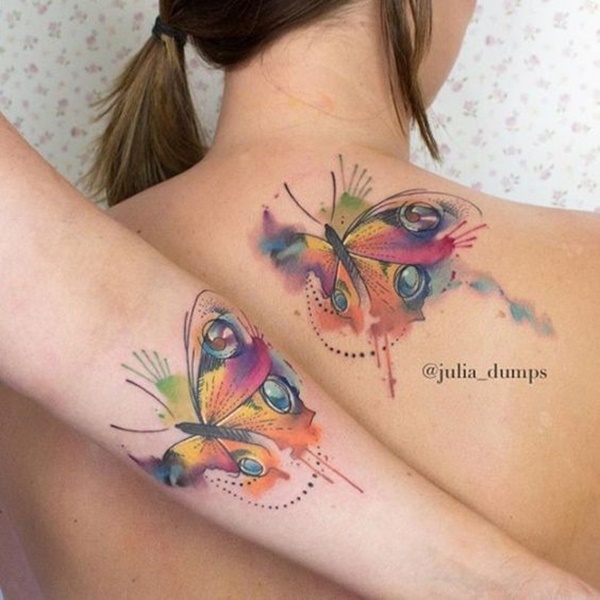 This tattoo set, depicted one wearer’s forearm the other wearer’s back, consists of a pair of hyper-stylized butterflies colored with diverse palette of watercolors. 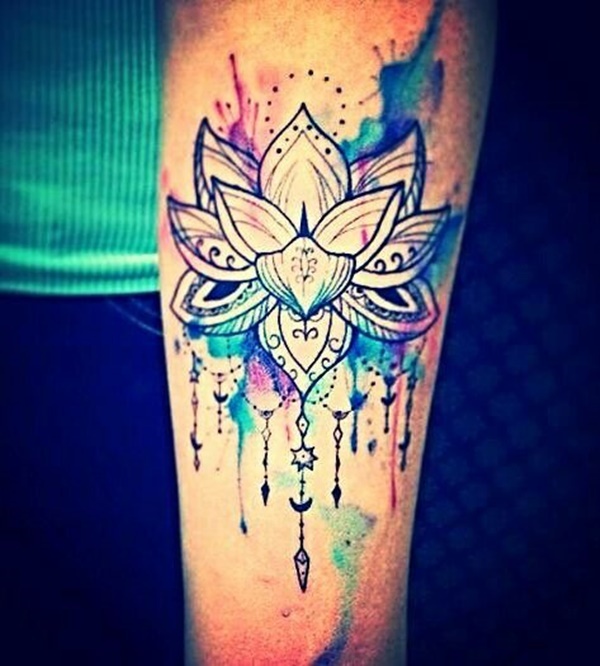 This piece, located on the wearer’s forearm, shows a pink lotus flower over a purple and blue watercolor background. Blue and purple smears color the traditionally black and white sides of the Yin-Yang symbol that represents balance in the universe. 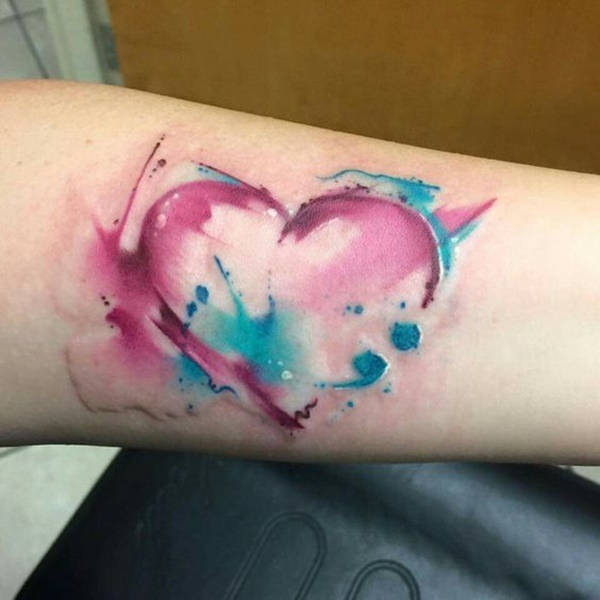 The outline of a heart is created using blue and pink watercolors that are smeared and splattered across the piece. 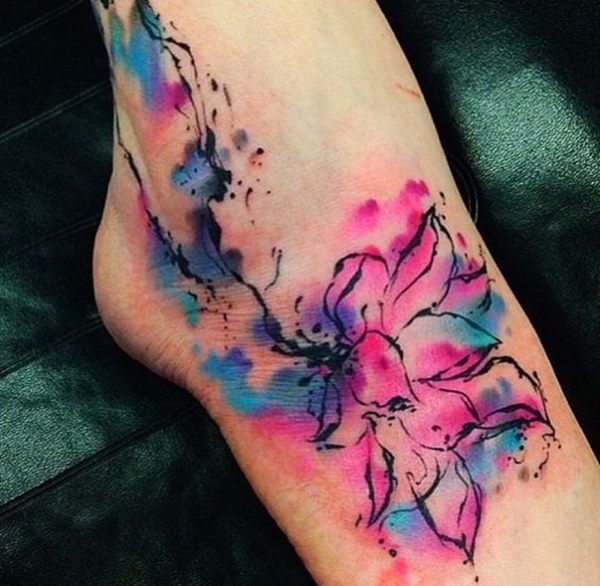 A flower comprised of black ink splatters is colored with a smear of purple, blue, and pink watercolors. 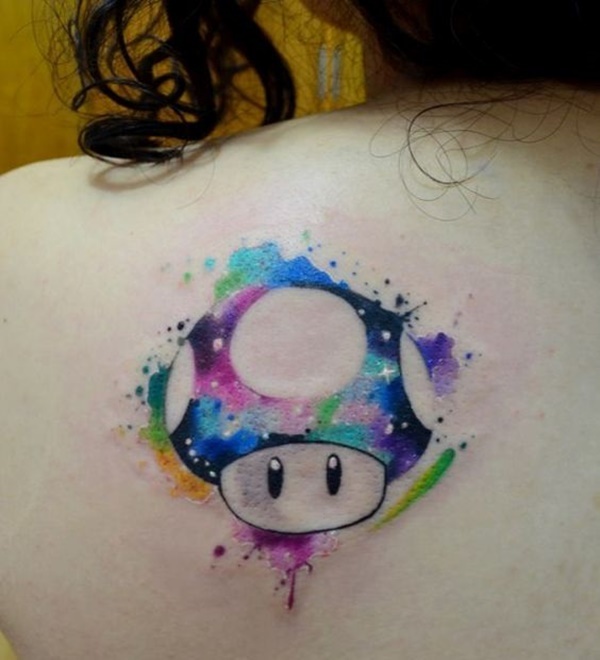 A mushroom, recognizable from the popular Mario video game franchise, is portrayed with a cosmic pattern in a varied palette. 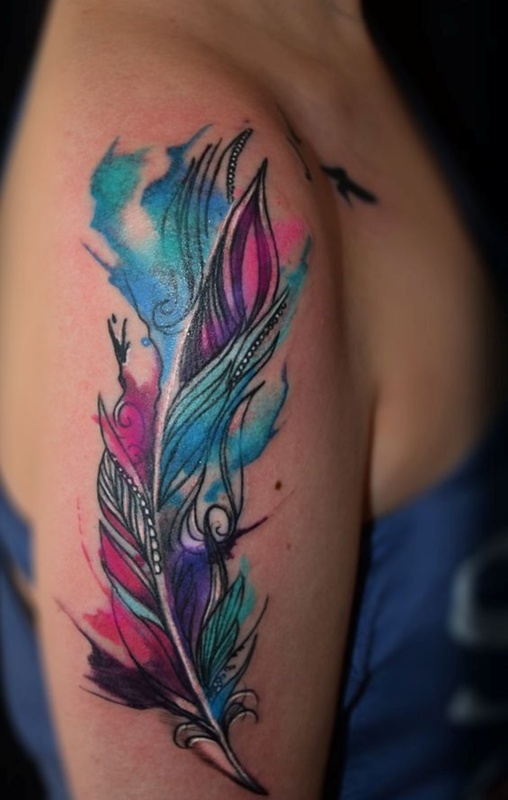 A feather is splashed with accents of blue, purple, and pink watercolors. The piece is detailed with touches of white ink that add a sense of complexity to the piece and help to enliven the vibrant watercolors. 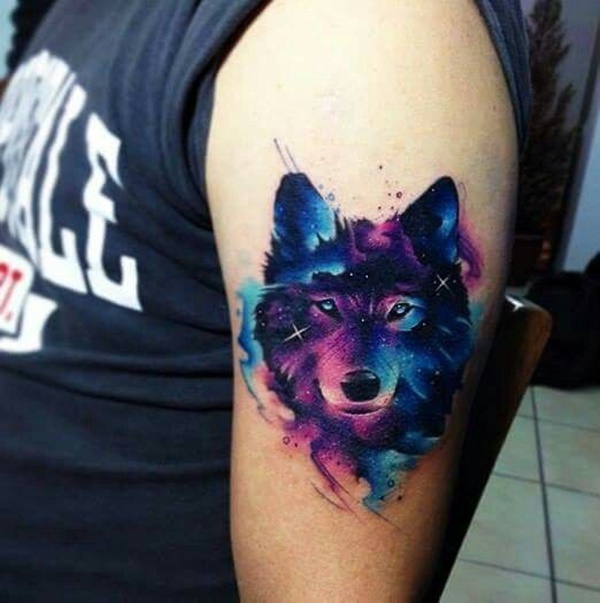 A wolf portrait is colored with a cosmic smear of watercolors detailed with glimmering stars. 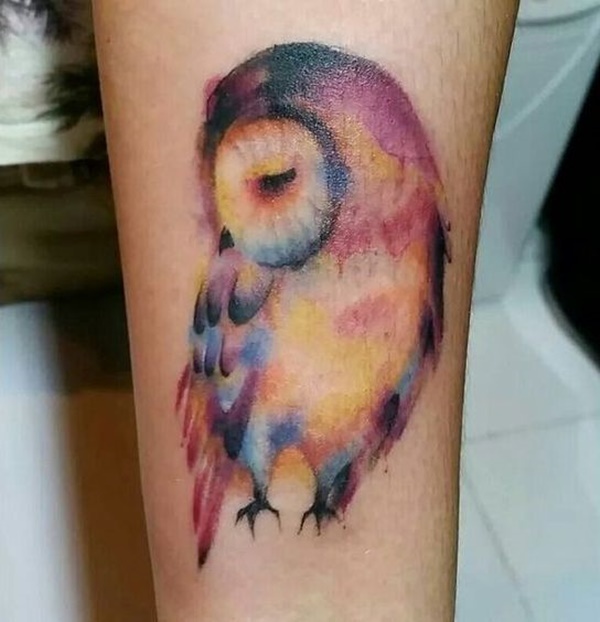 A beautifully done piece that does a great job of distributing color to create depth in the cosmic imagery. 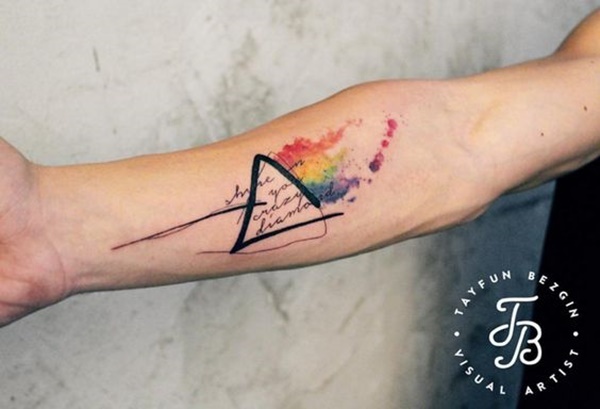 Staggered outlines of a triangle accompany a watercolor triangle accented with ink splattered beneath the shapes. 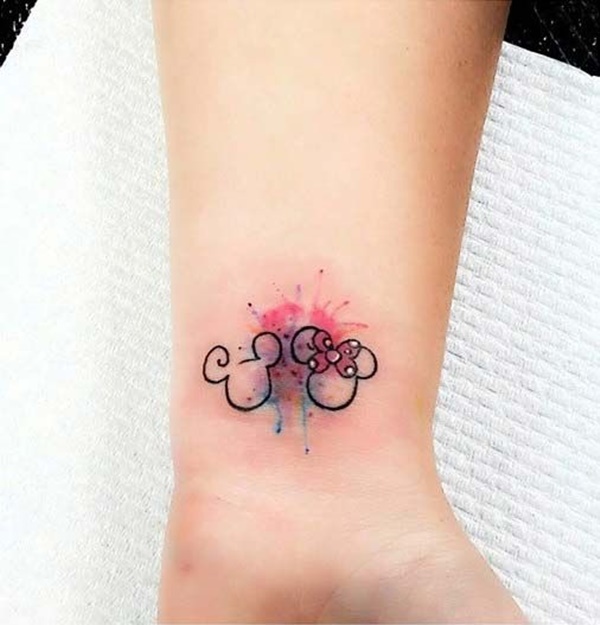 The same concept is used on the opposite arm, instead utilizing circles as the shapes and exclusively colored with black ink. 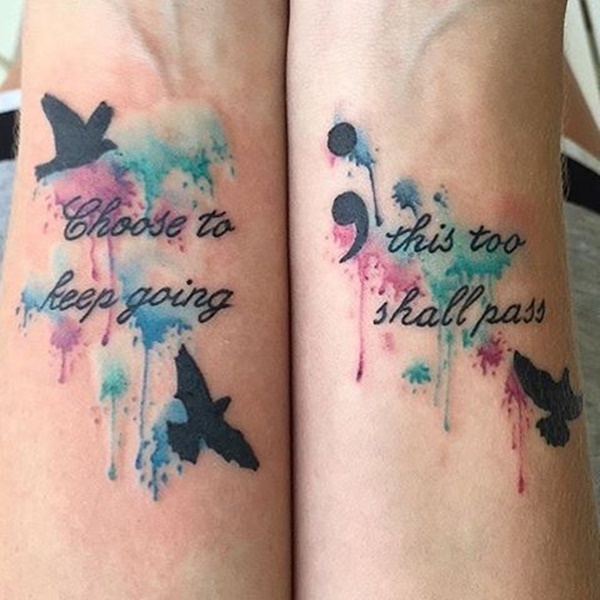 Black bird silhouettes surround blue and purple watercolor smears with the quote, “Choose to keep going; this too shall pass,” scrawled over the watercolors. 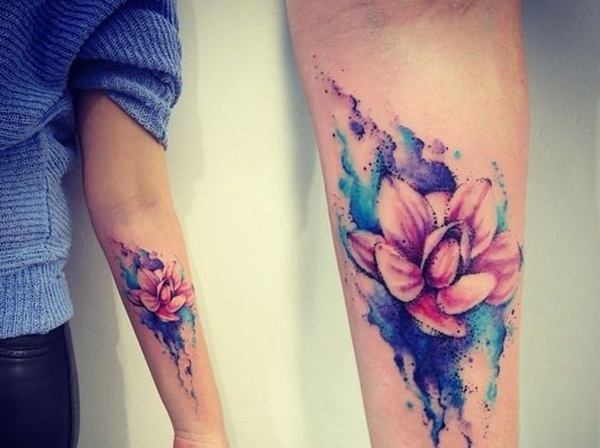 A lotus is colored with pink and yellow watercolors and surrounded by darker purple watercolor smears. 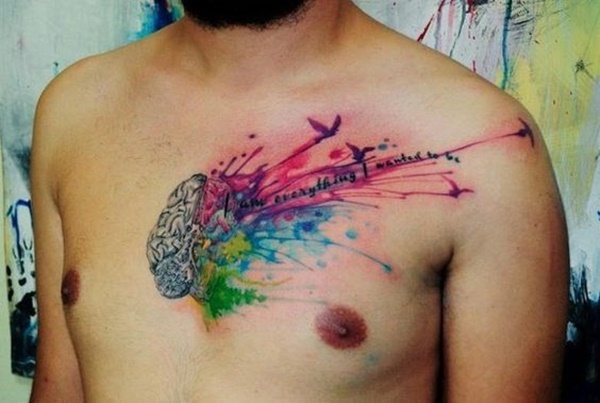 The piece is located on the wearer’s upper thigh just in front of the wearer’s buttocks. 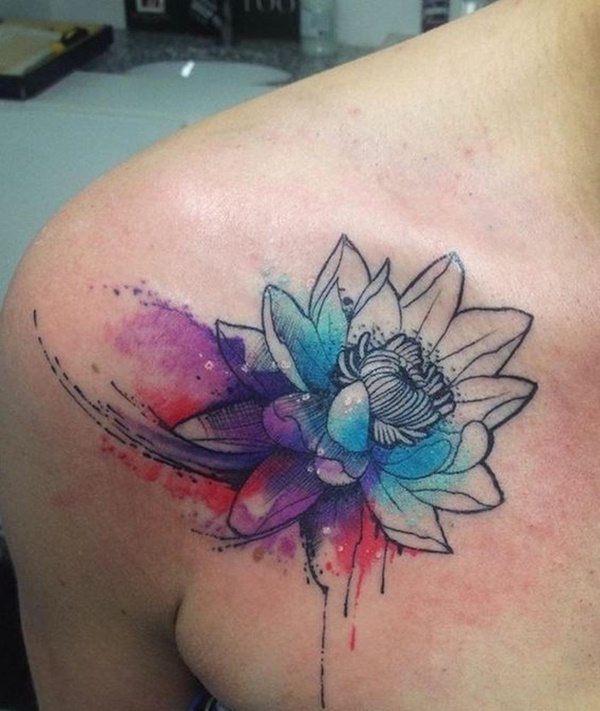 A black and white lotus flower is accented by hanging beads as well as blue and purple watercolors. 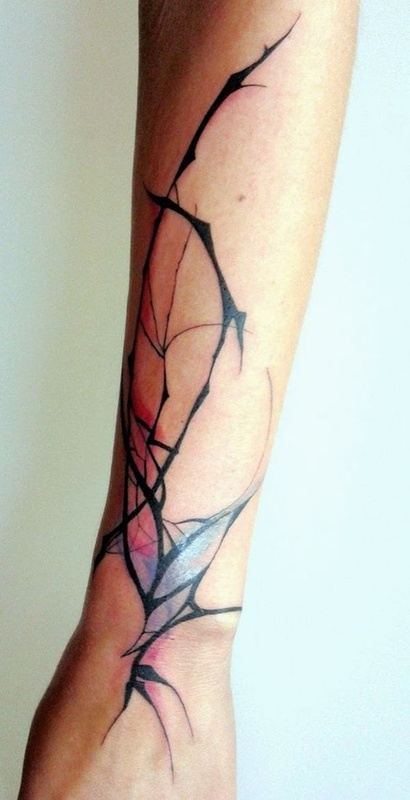 This abstract piece shows spindly black lines filled with very feint blue and purple watercolors scrolling down the wearer’s forearm. 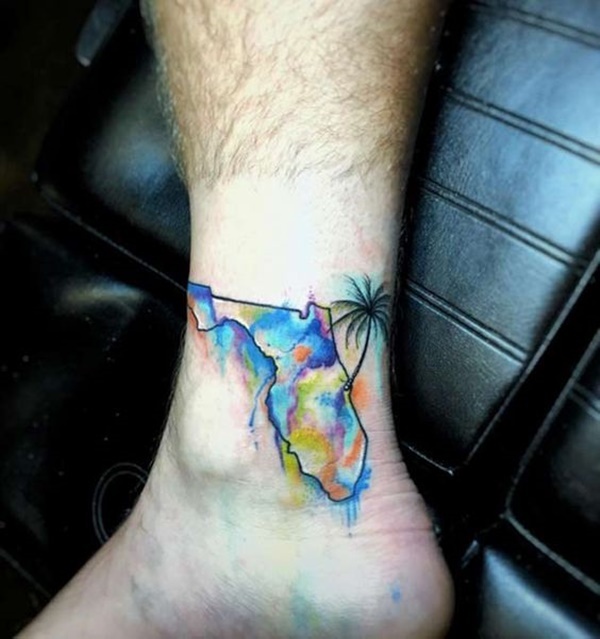 The outline of the state of Florida is colored with a varied palette of watercolors while a palm tree sprouts from the Eastern side of the state. A lion is depicted with a black and gray body and a multicolored watercolor mane. 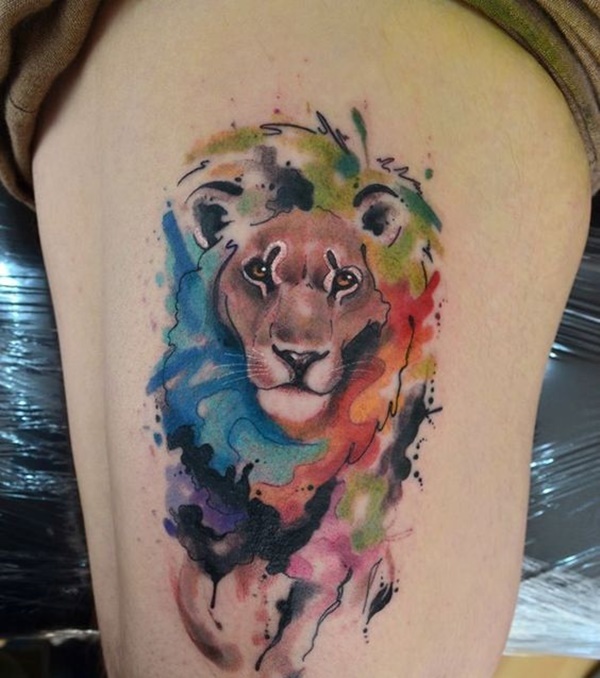 The colors are laid on a little more heavily than other watercolor tattoos to create a distinct separation between the body and the mane. 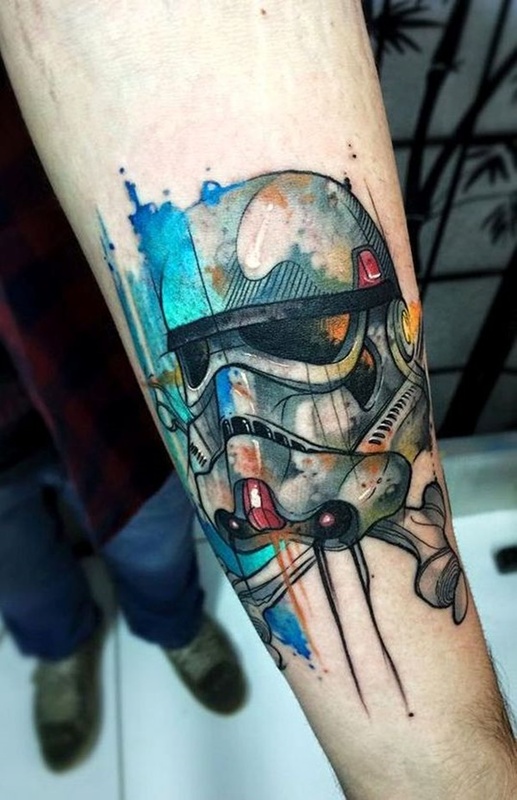 The helmet of a Stormtrooper from the Star Wars franchise is rendered over a pair of crossbones and accented with small touches of watercolors. 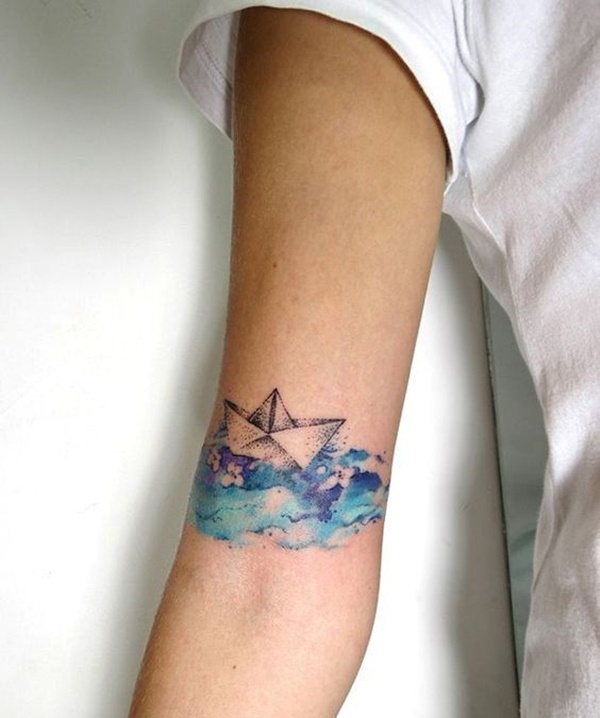 An origami boat floats atop a blue and purple watercolor smear in this tattoo depicted on the wearer’s upper arm. 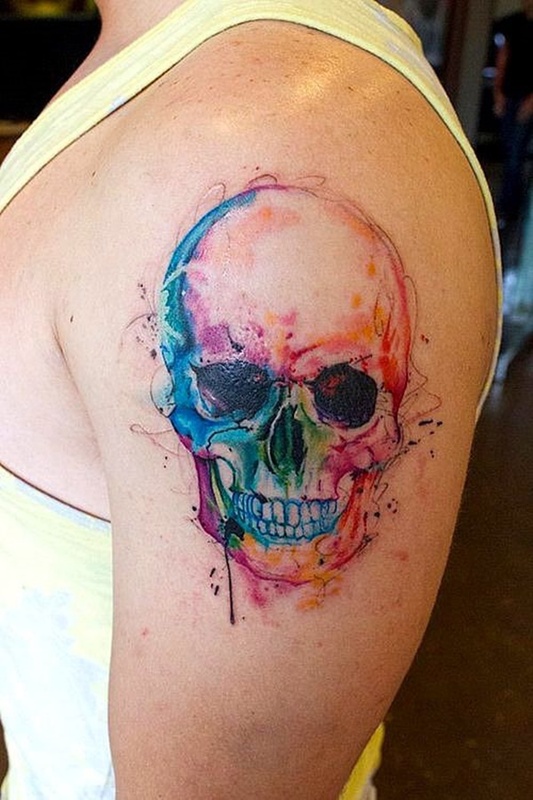 A skull is comprised entirely of watercolors in this well done piece that does a great job of detailing the skull with the various colors. 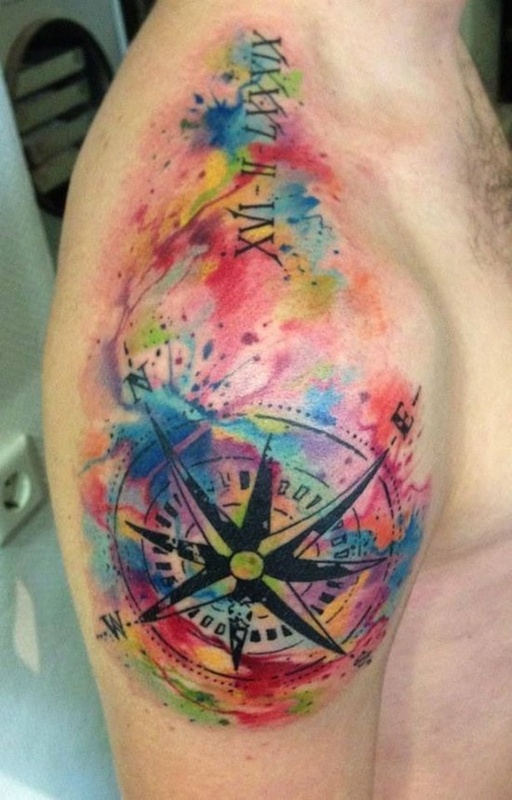 A compass is illustrated over a smear of red, yellow, purple, blue, and orange watercolors. Only the directions of North and South are represented on the compass and the letters are written in an elaborate scrolled font. A black paw print is accented with one red and two black hearts. 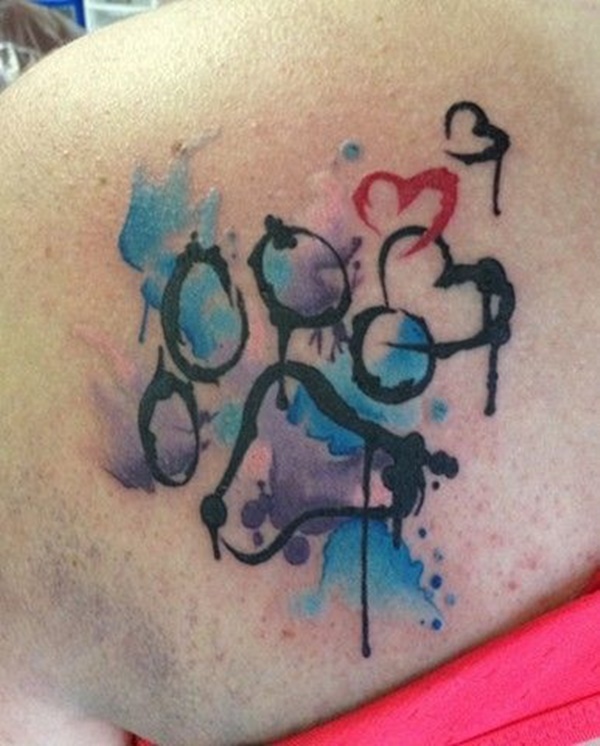 The piece is colored with a blue and purple smear and is located over the wearer’s left shoulder blade. 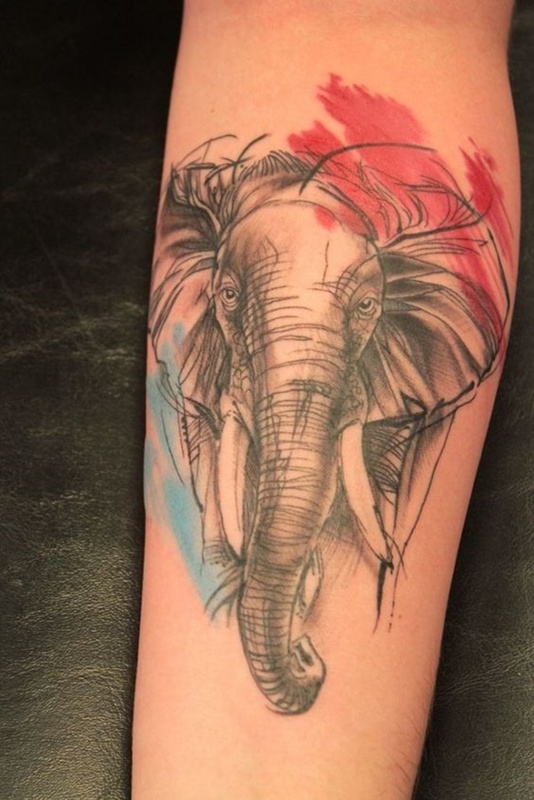 A black and gray elephant portrait is embellished with a red watercolor smear in the upper right corner of the piece and a blue watercolor smear in the bottom left corner. 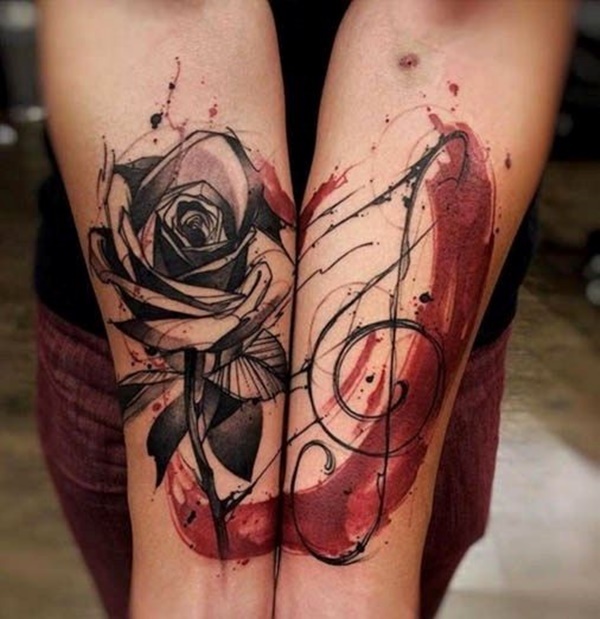 A black and gray rose and musical staff are accented by a red watercolor smear that vaguely takes the shape of the heart. 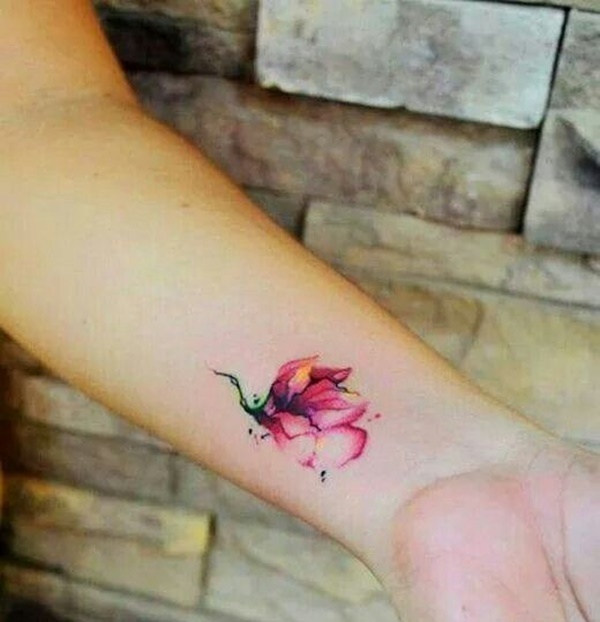 A pink flower is detailed with yellow accents and a wispy green stem. 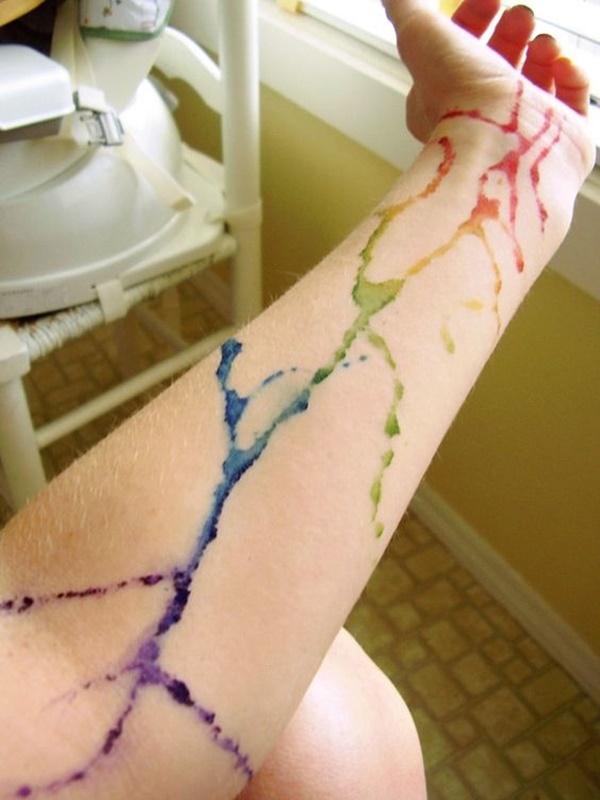 A trail of various watercolors runs down the wearer’s left forearm in this tattoo. 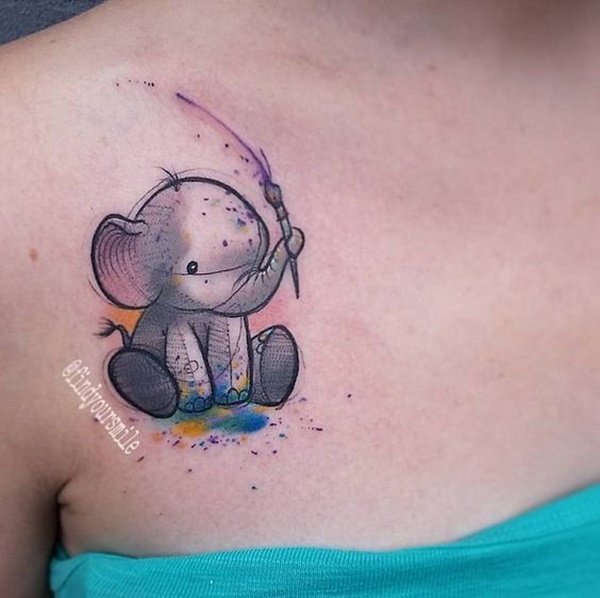 A cartoon-style elephant is pictured in a seated position with its trunk wrapped around a paint brush. A purple streak is pictured bursting from the brush while the animal sits atop a blue and yellow watercolor smear. 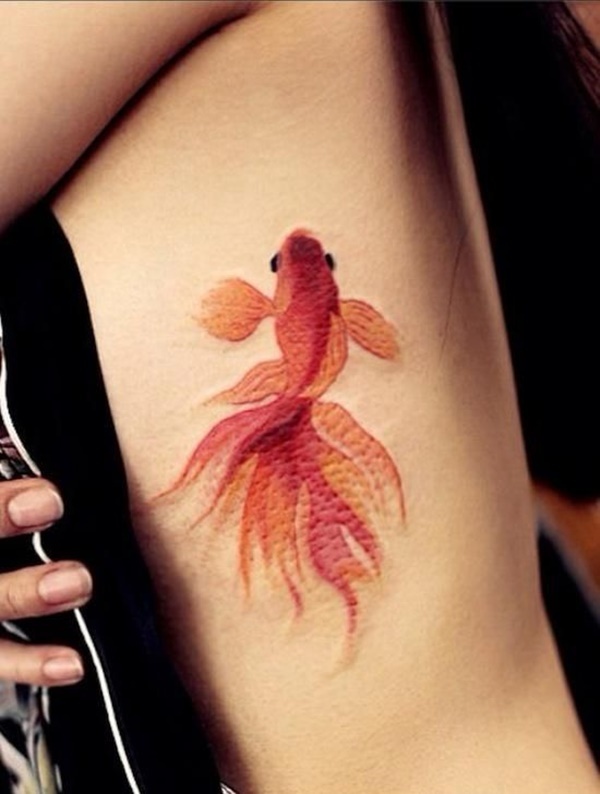 A surprisingly life-like goldfish is pictured on the wearer’s upper left arm. 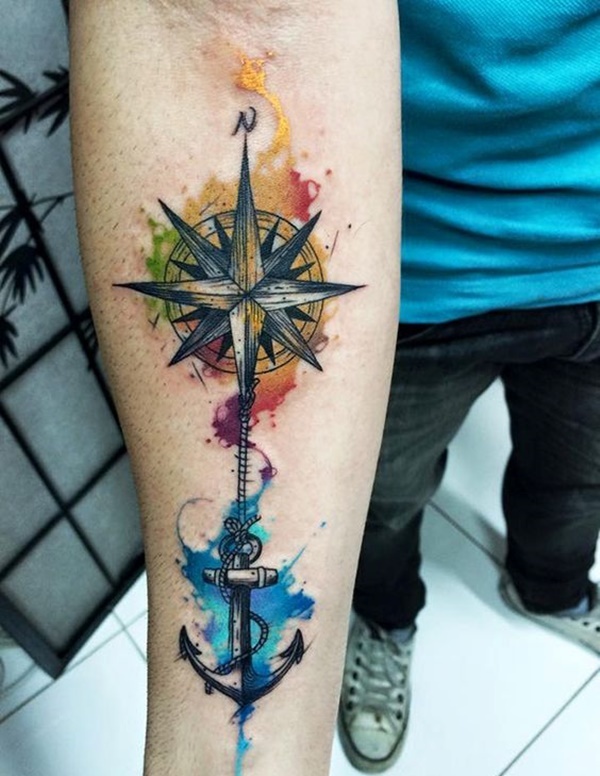 A compass attached to an anchor is represented over a series of watercolor smears in this tattoo illustrated on the wearer’s forearm. Silhouettes of the heads of famous Disney character Mickey and Minnie Mouse are pictured over a watercolor splatter. 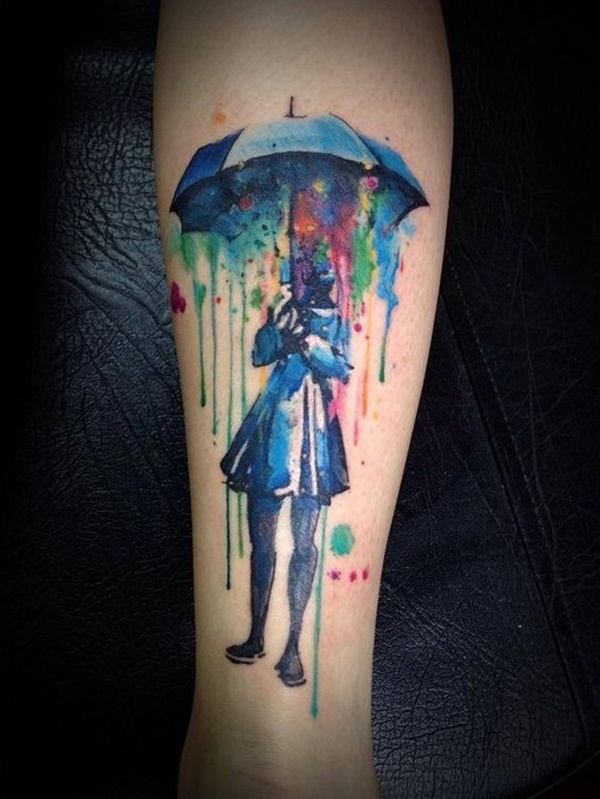 A woman holding an umbrella is rendered in blue ink while a cascade of watercolors pours out from underneath the umbrella. A cresting wave is pictured inside of a circular vignette in this watercolor piece that utilizes black and blue ink. 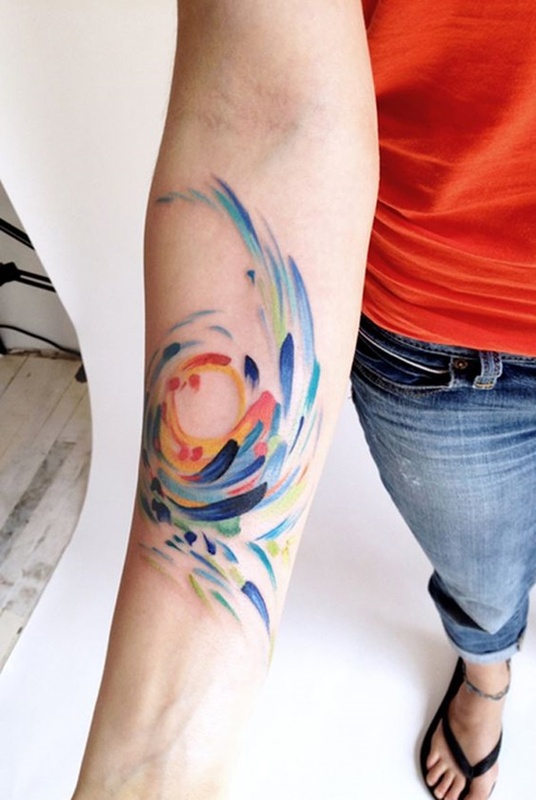 A series of watercolors swirl in a circular pattern and flourish upward in this piece rendered on the wearer’s forearm. 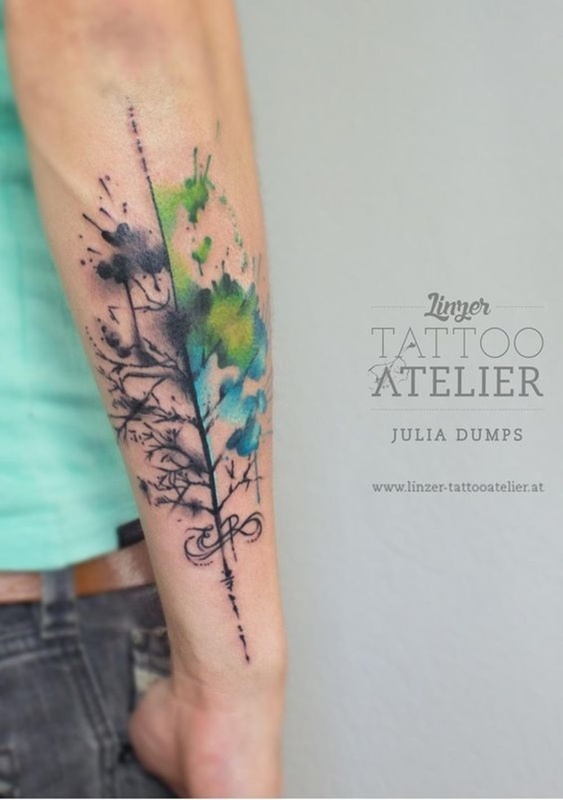 Soft touches of watercolors surround prominent black streaks while small white dots are used to accent the piece in this tattoo. 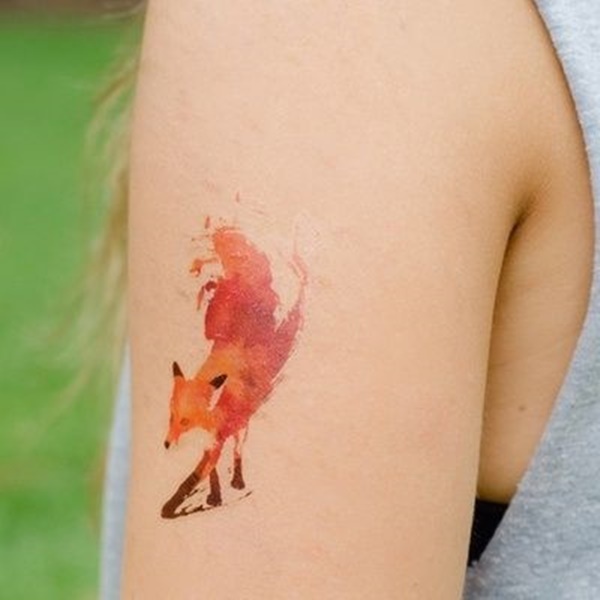 A fox with a backside that devolves into a smudge is illustrated mid-step in this watercolor piece that utilizes a palette of orange and brown. A musical staff sits atop the bars used to write music in this watercolor piece that distributes the watercolors across the bars. 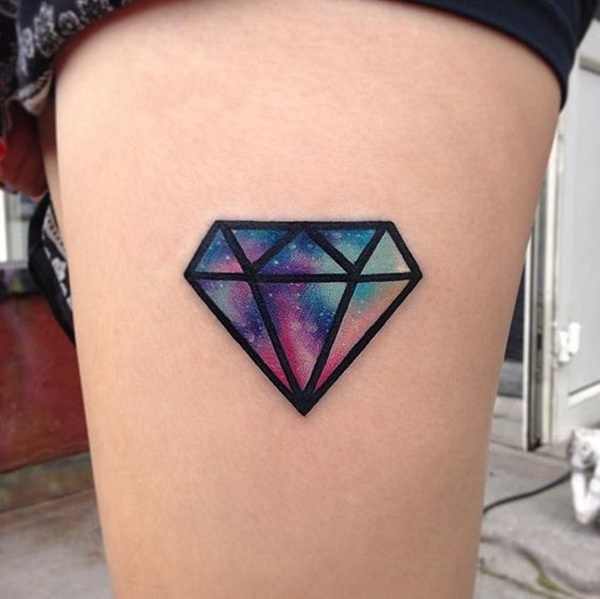 A simplified rendering of a diamond is filled with a cosmic pattern. 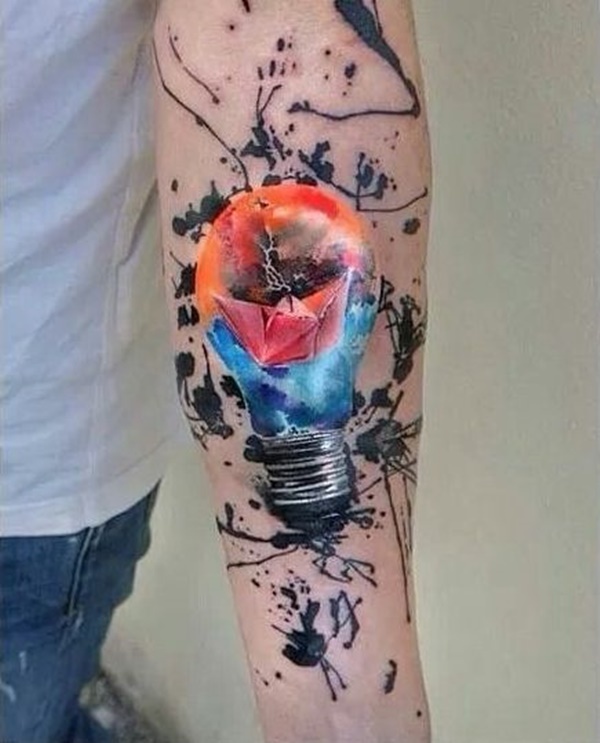 A light bulb contains vibrant blue and red colors as well as an origami swan in this imaginative tattoo. 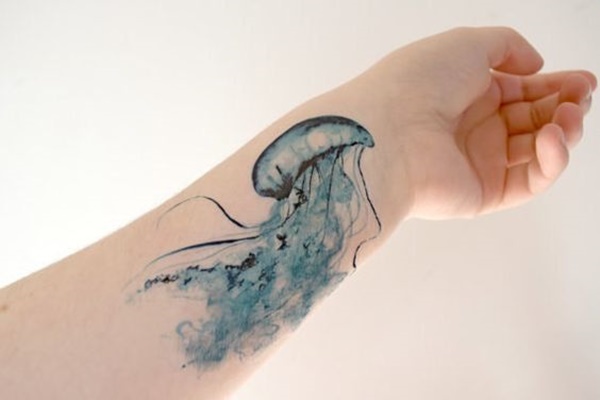 A blue jellyfish is rendered on the wearer’s forearm in this tattoo. 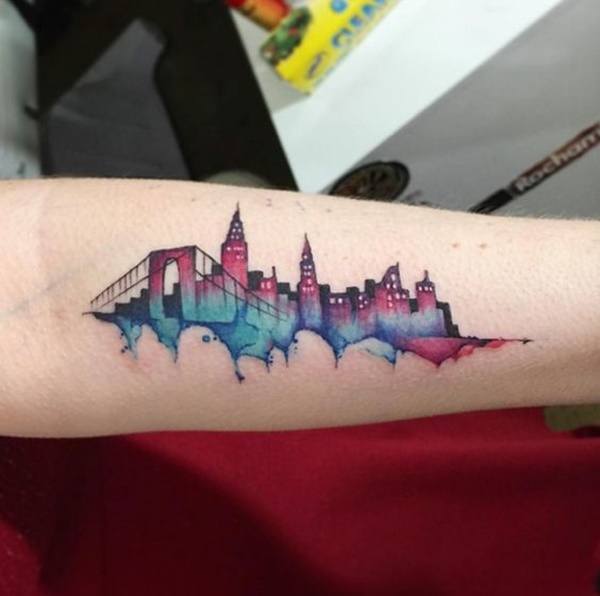 The Brooklyn bridge is represented in the foreground of this tattoo that depicts the skyline of New York City in a blue and red color palette. 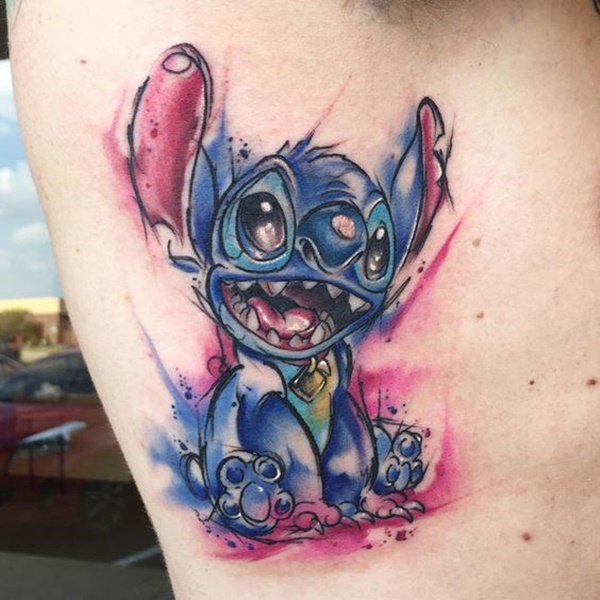 A stylized rendering of the character Stitch from the movie Lilo & Stitch is seen in this tattoo. 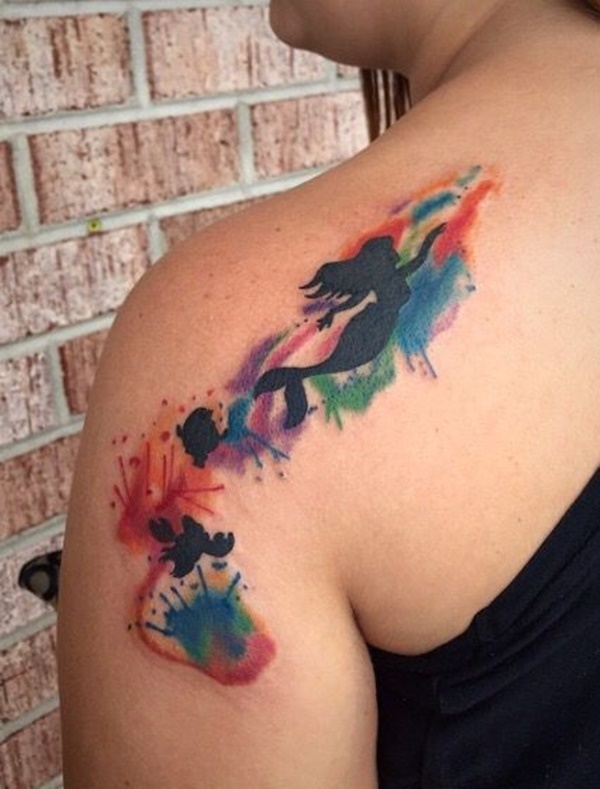 The silhouette of the Little Mermaid is seen over a colorful watercolor smear. 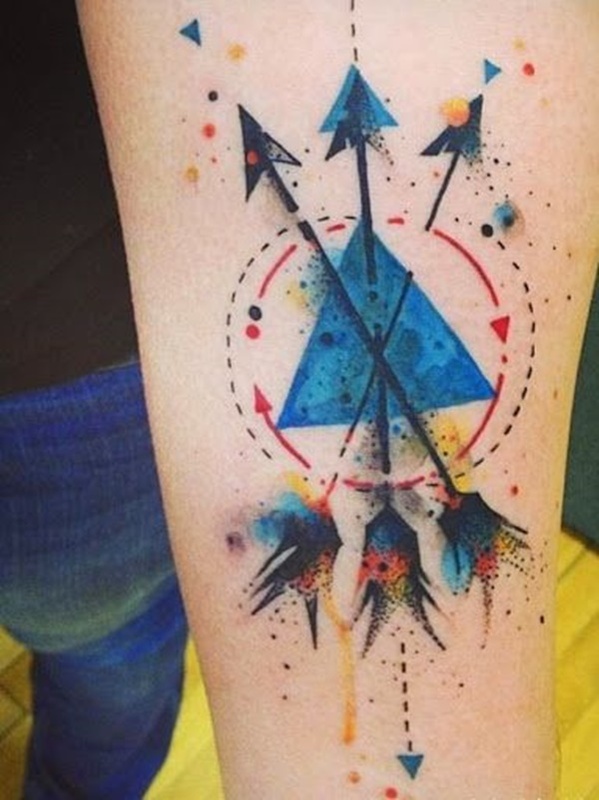 Three arrows intersect over a triangle contained within a pair of circles in this vibrant tattoo. 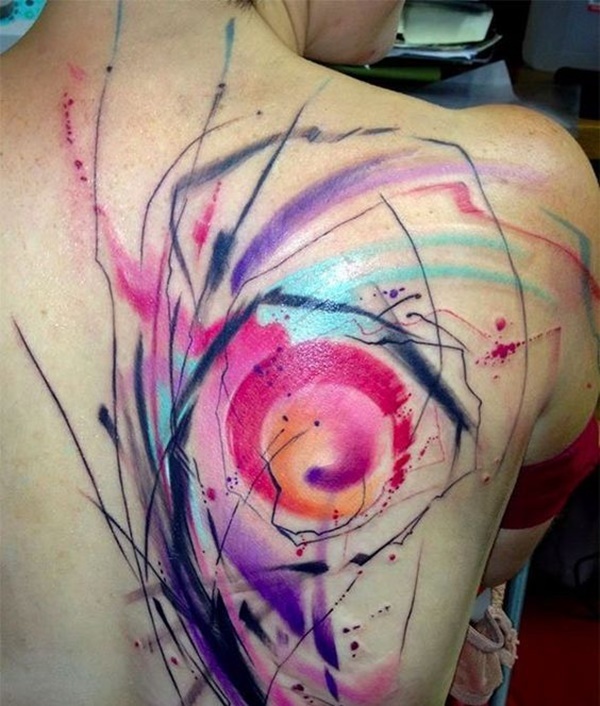 A black and gray mandala is seen over a watercolor smear in this tattoo. 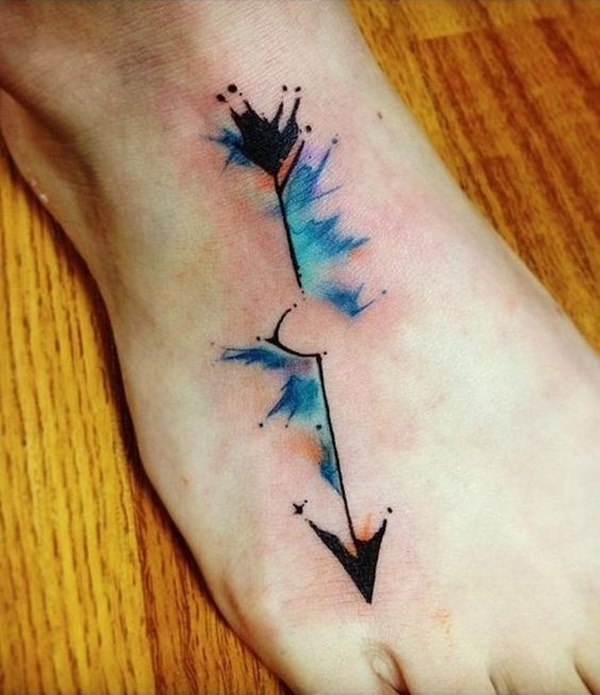 A stylized arrow is portrayed with bursts of blue watercolors along the shaft. 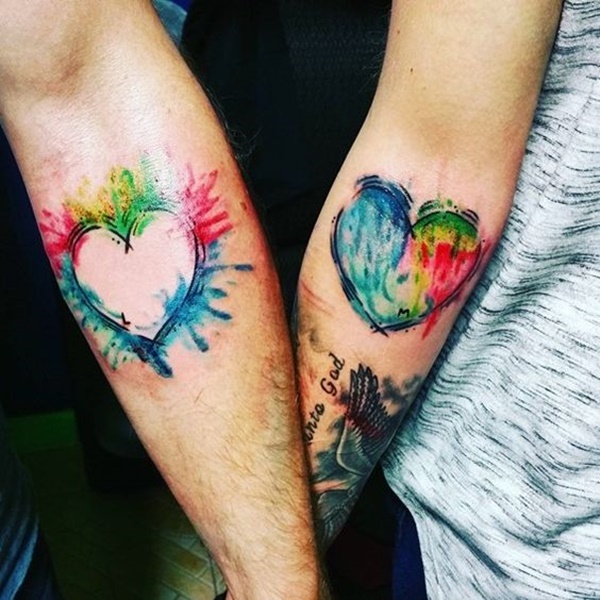 This tattoo set illustrates a pair of hearts, one with the watercolors contained within the heart and the other with the watercolors outlining the heart. 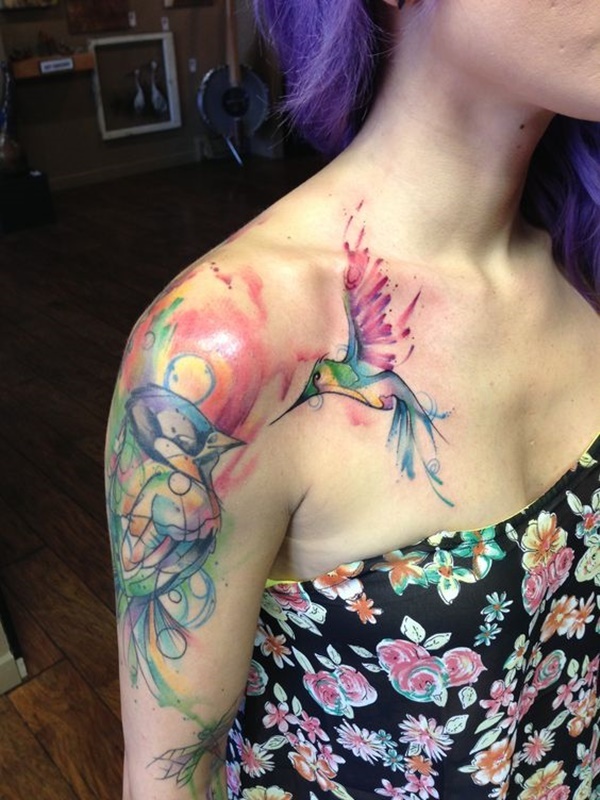 A vibrantly colored hummingbird is depicted underneath the wearer’s right collarbone. 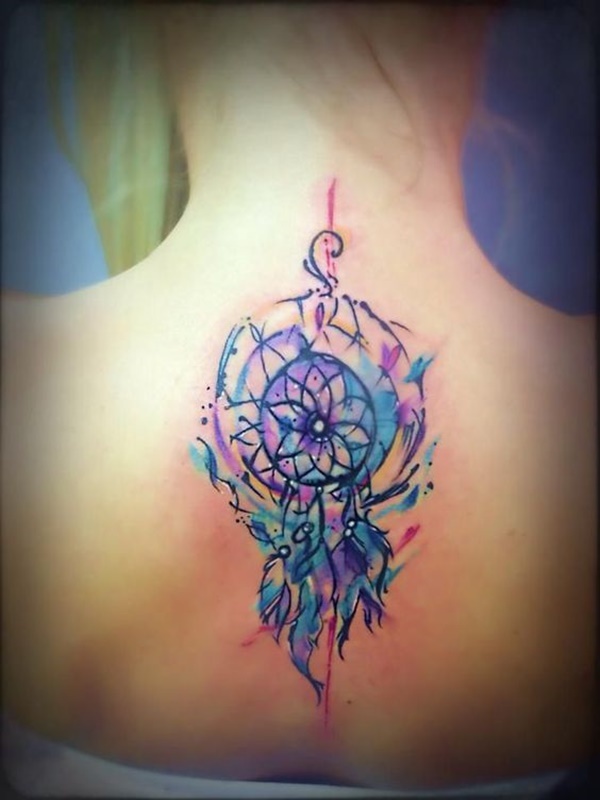 A blue and purple dream catcher is illustrated in the middle of the wearer’s back. 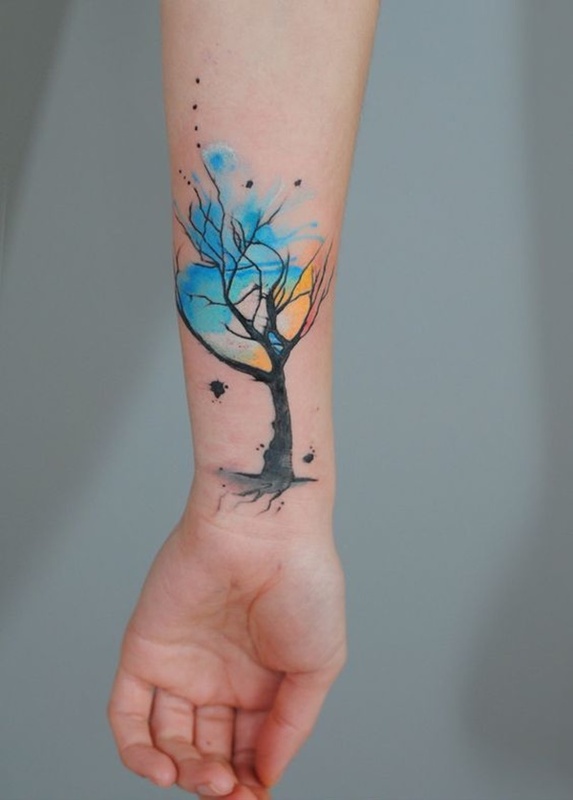 A barren tree is portrayed with a smear of watercolors between the branches. A landscape of pine trees is created by using a single color for every individual tree. 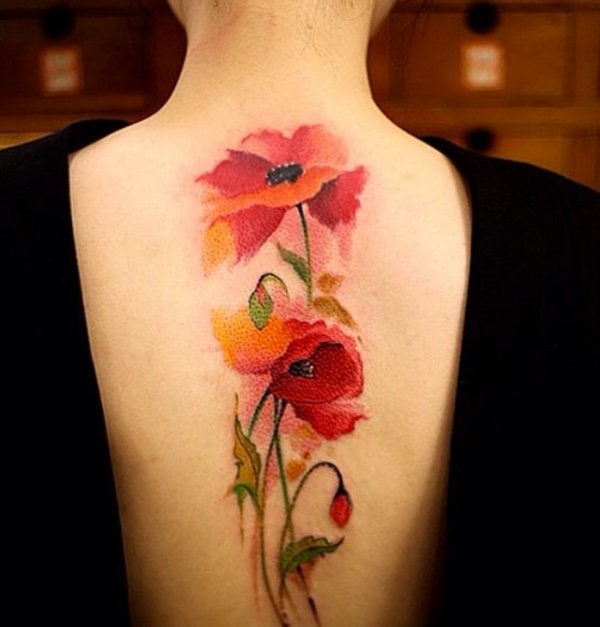 A pair of red and orange flowers are depicted in the middle of the wearer’s back. 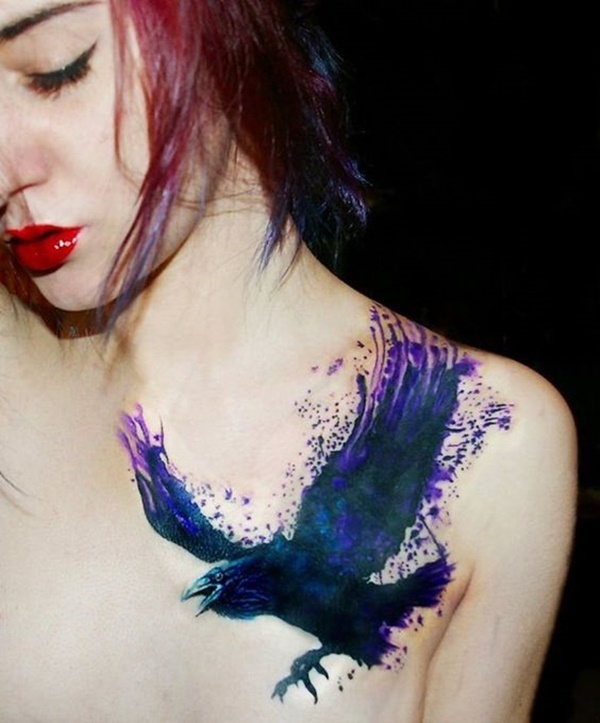 A raven is depicted in mid-flight with purple embellishments around the ends of the bird’s feathers. 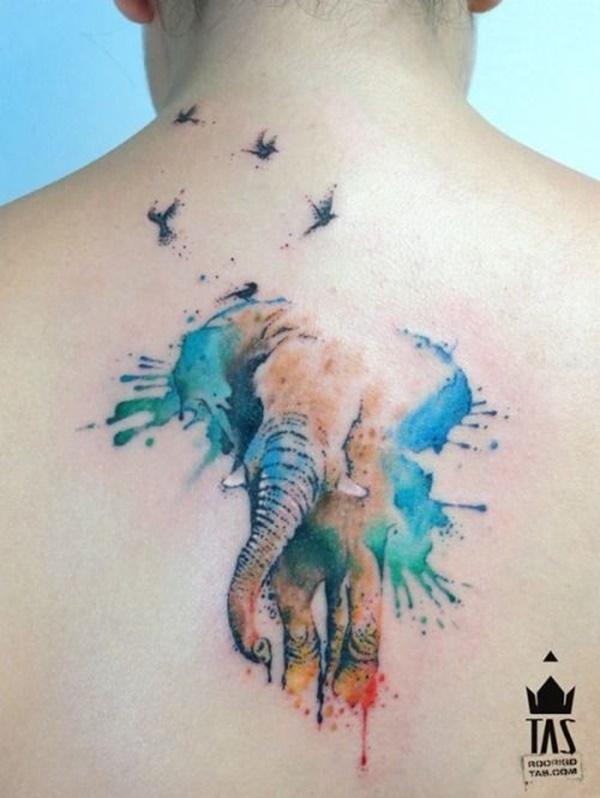 A primarily brown elephant is accented with bursts of watercolors around the outlines of the animal while bird silhouettes are shown above the main image. 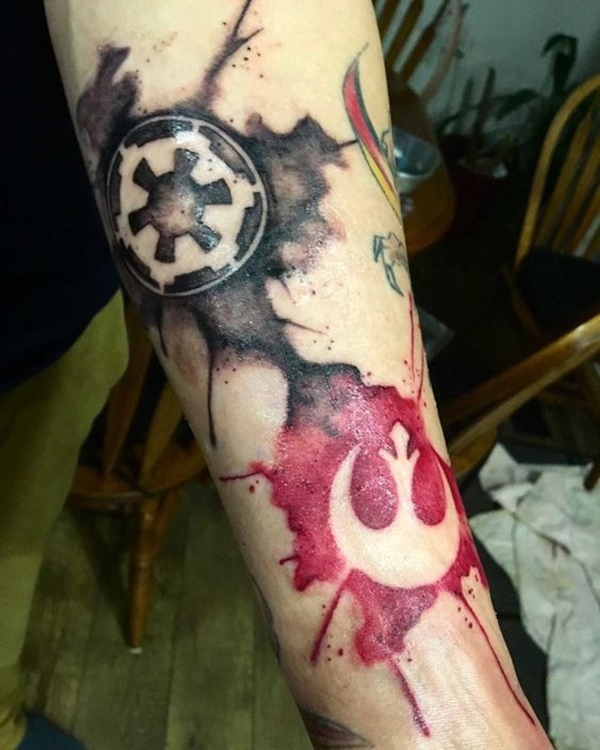 An is depicted with its head turned away from the observer in this forearm tattoo. 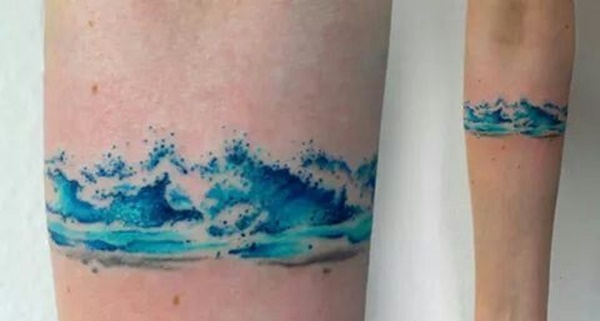 Waves are shown cresting across the wearer’s forearm in this tattoo. 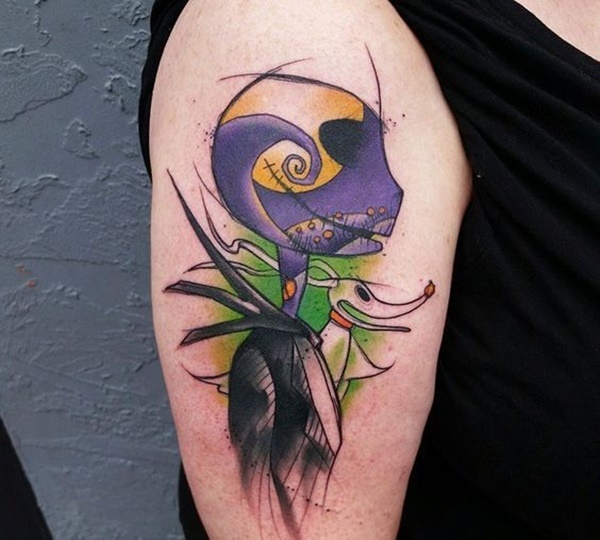 A portrait of Jack Skellington and his dog are depicted on the wearer’s bicep in this tattoo. 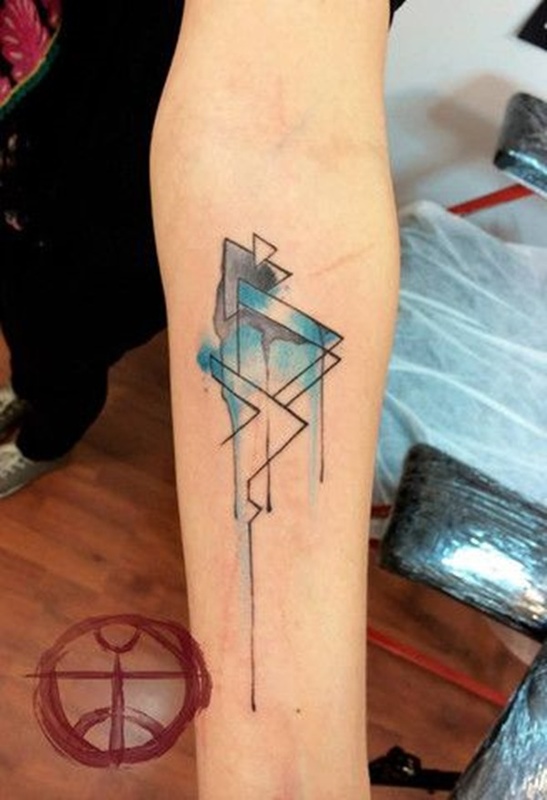 Lines trail off a series of triangles accented with a blue and black watercolor smear in this forearm tattoo. 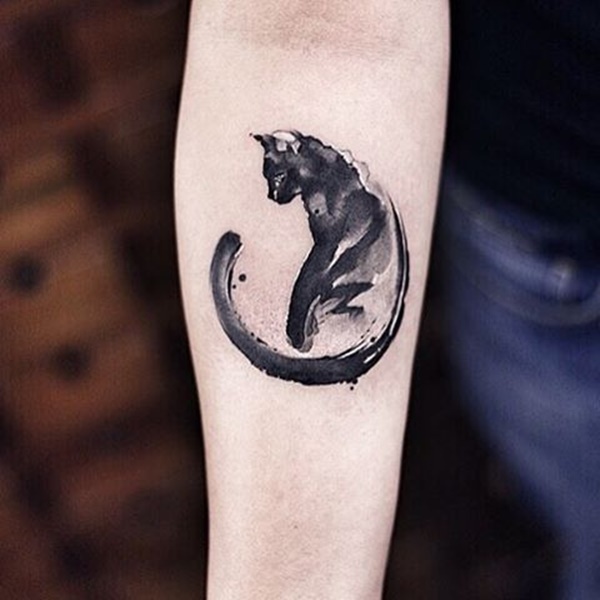 A portrait of a black cat staring at its tail is rendered in this forearm tattoo. 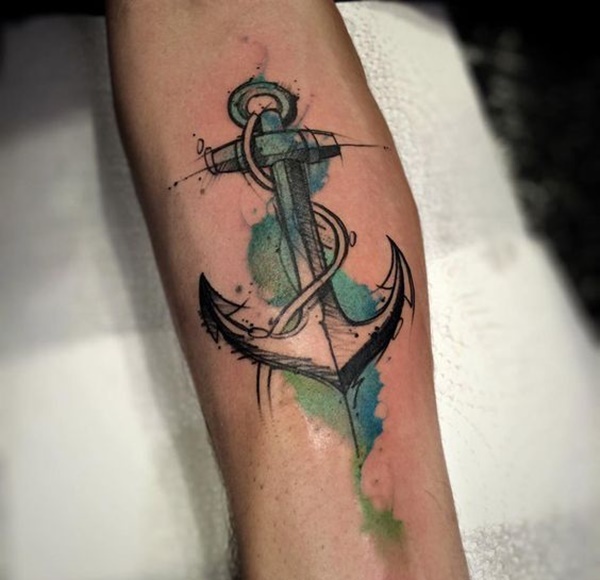 A ship anchor wrapped with a rope is embellished with blue and green watercolors in this forearm tattoo. Watercolor smears are accented with black ink spots and definitive black lines. 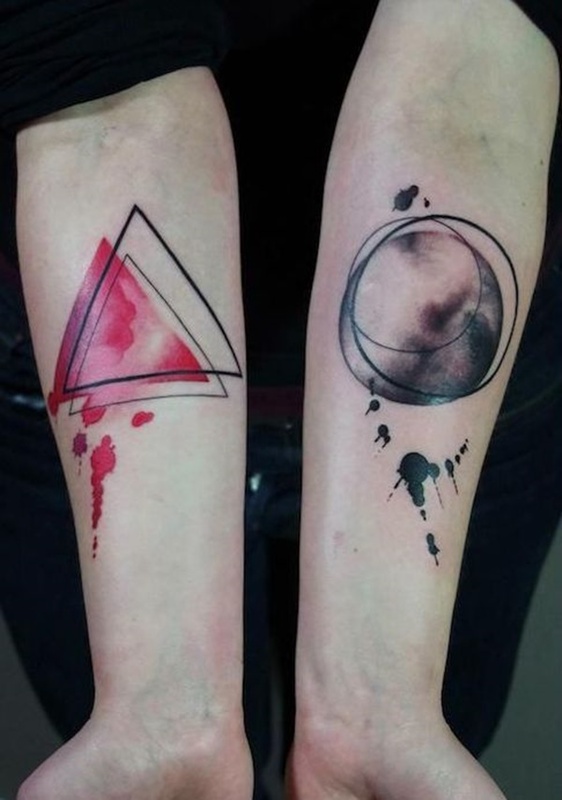 Familiar symbols that I can’t place are illustrated in black and red watercolor spots in this tattoo. 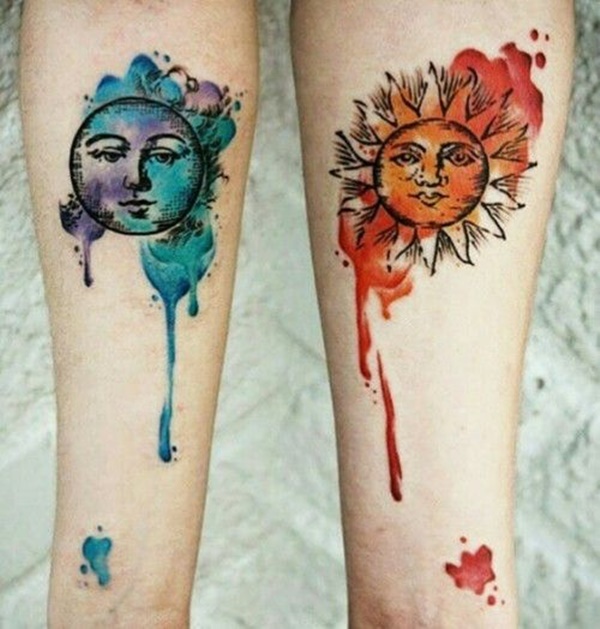 A moon and sun are embellished with blue and red watercolors, respectively. 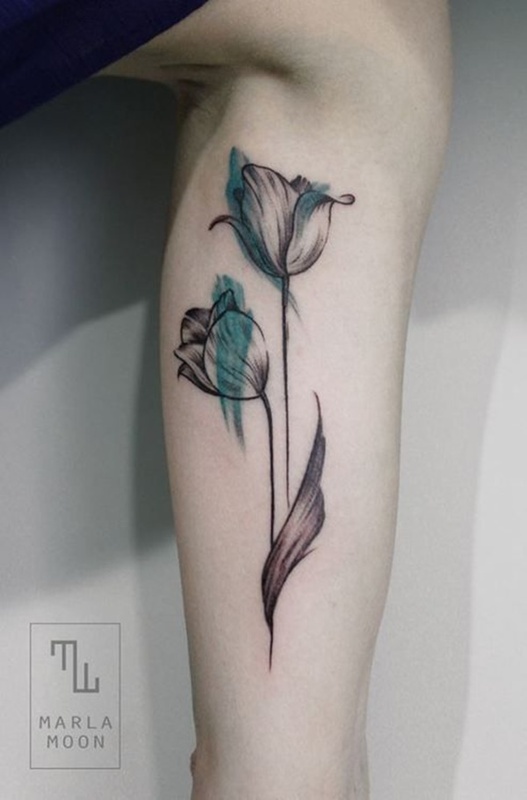 Black and gray flowers are accented with small blue watercolor smears. 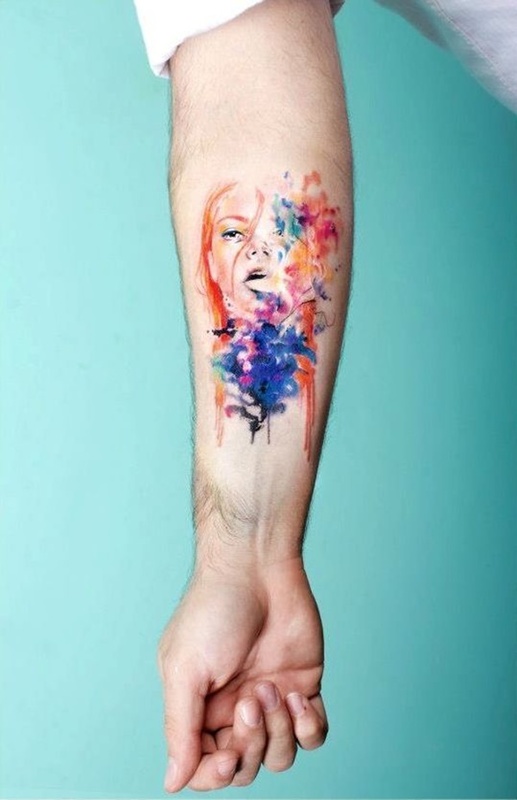 A portrait of a woman blowing plumes of colorful watercolor smoke is depicted on the wearer’s forearm. 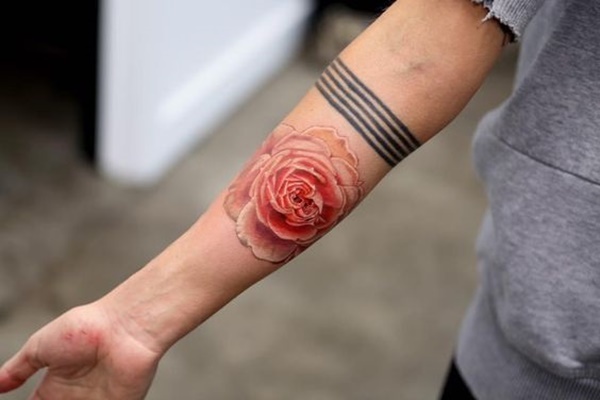 A rose is depicted with delicate red coloring on the wearer’s forearm in this tattoo. 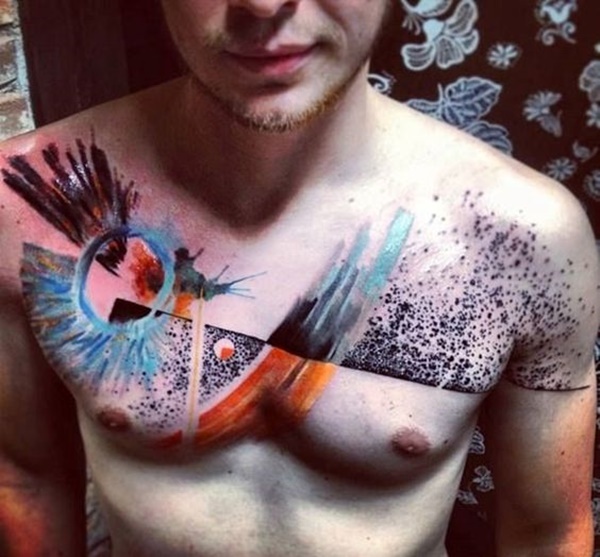 This abstract piece is comprised primarily of blue, orange, and black watercolors and is illustrated across the wearer’s chest. 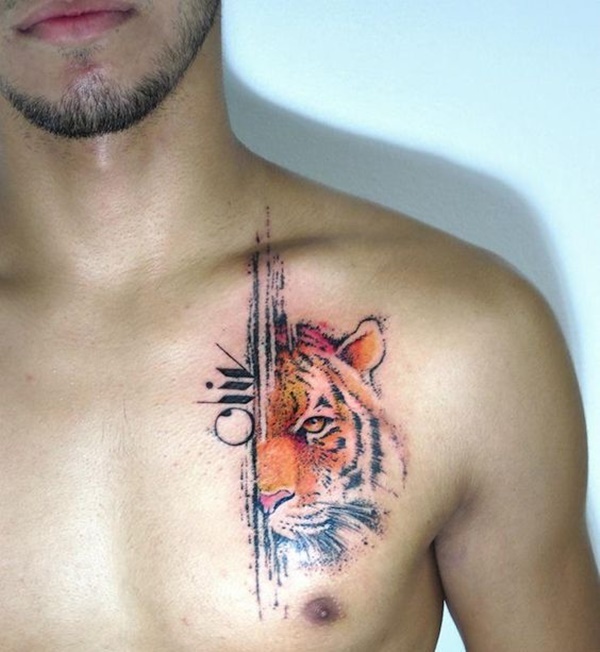 Half a portrait of a tiger’s face is depicted next to a series of abstracts lines and shapes. 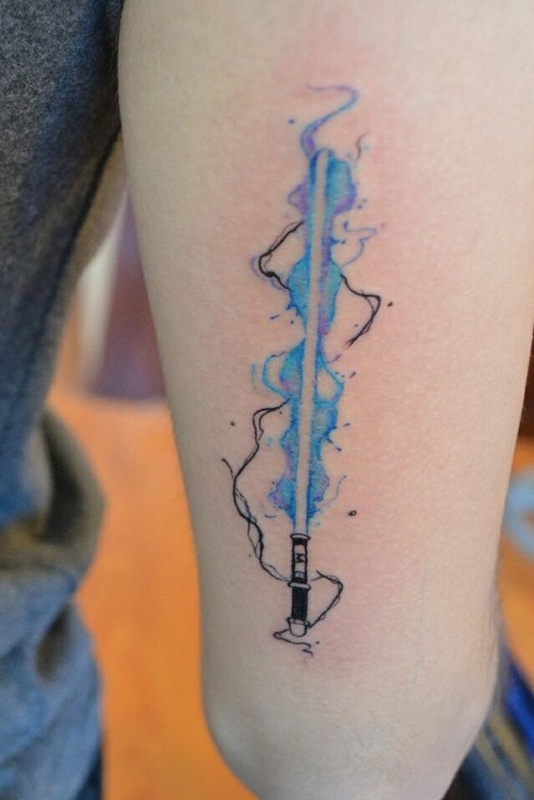 A blue lightsaber is portrayed with energy billowing around the laser of the weapon. 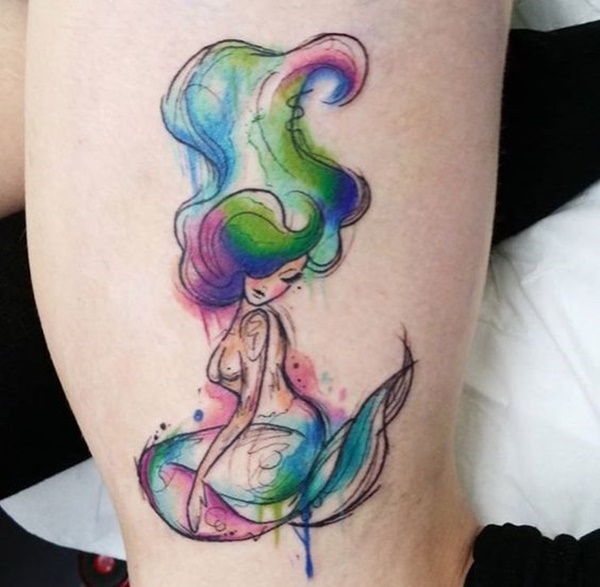 A vibrantly colored mermaid is depicted in this tattoo. 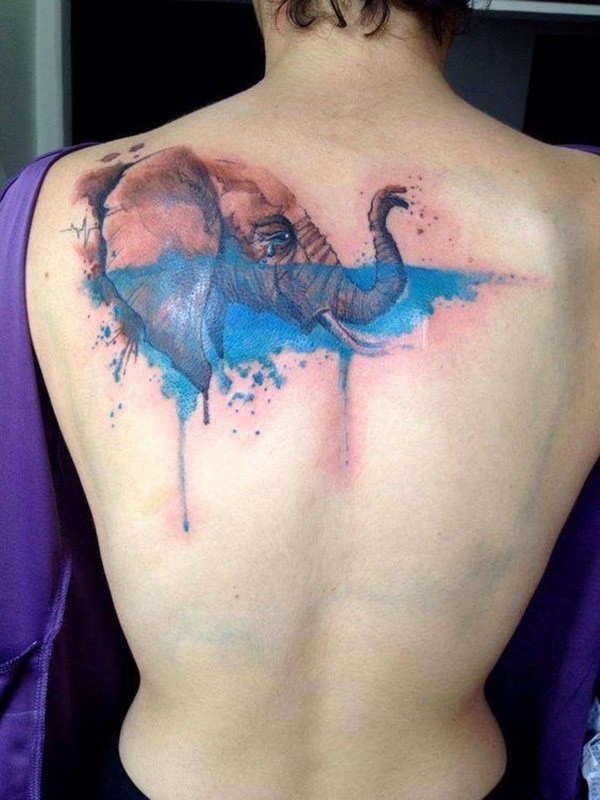 A profile portrait of an elephant half-submerged underwater is rendered with a single tear falling from the animal’s eye. 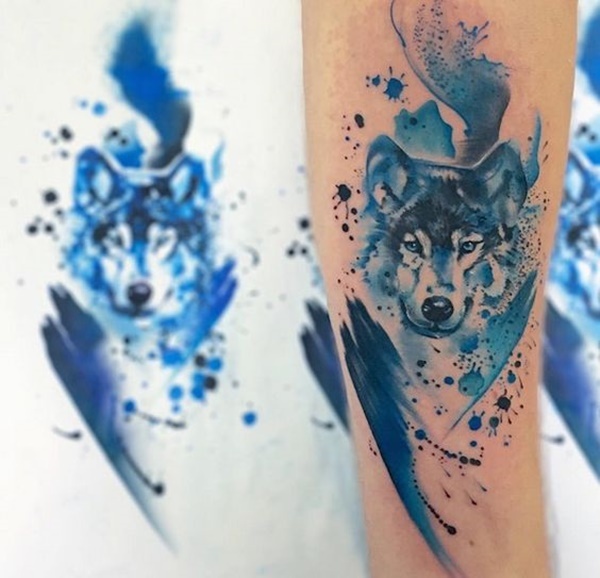 A blue color palette is used to depict the portrait of a wolf’s face surrounded with abstract smears and watercolor blots. 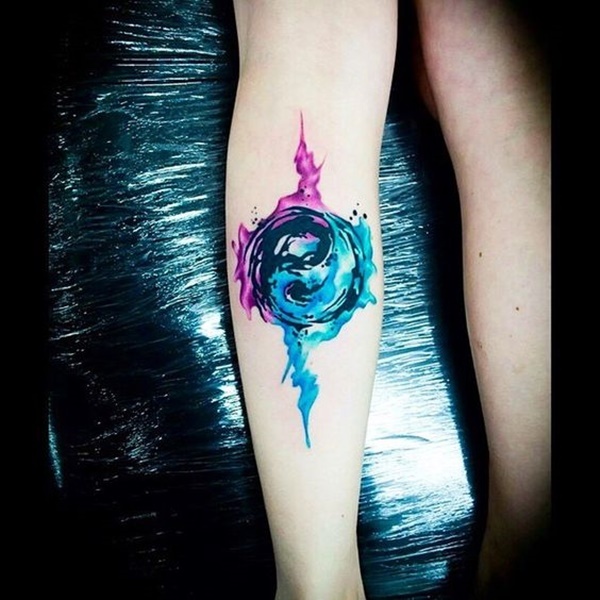 This abstract piece features a swirling circular shape in the center that is pulling the rest of the piece into the vortex that it is creating. 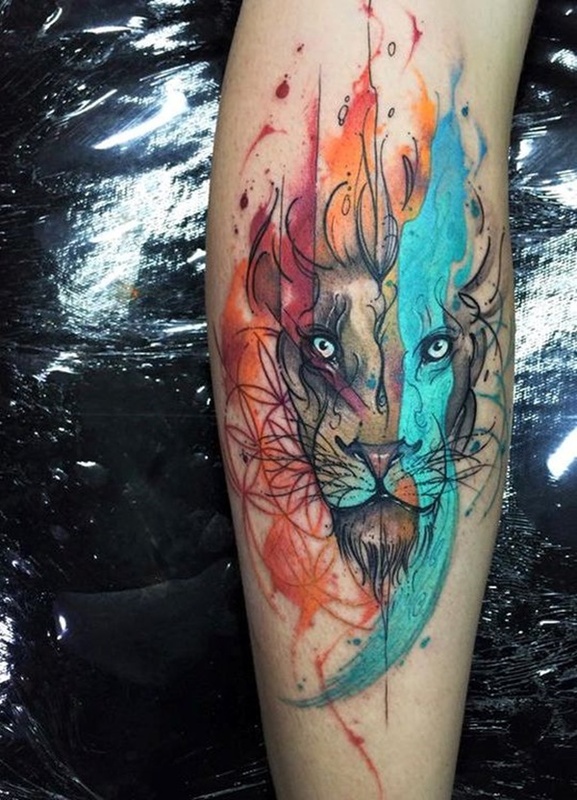 A lion portrait is separated by definitive lines running down the piece that separate the different colors used to create the tattoo. 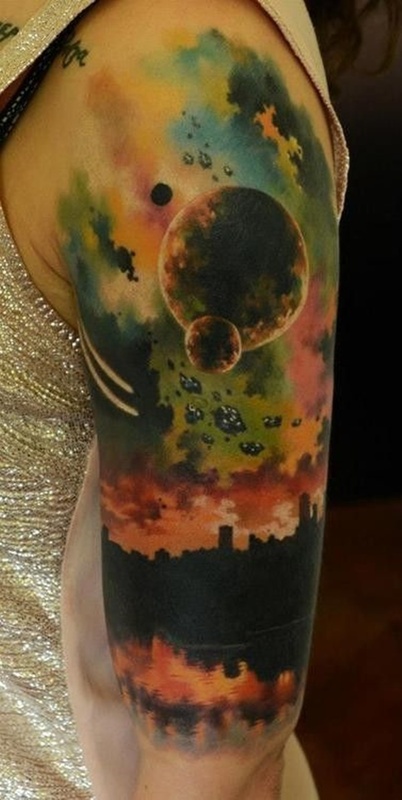 A cosmic scene featuring planets and meteors is depicted over a city skyline that reflects off the river water below. 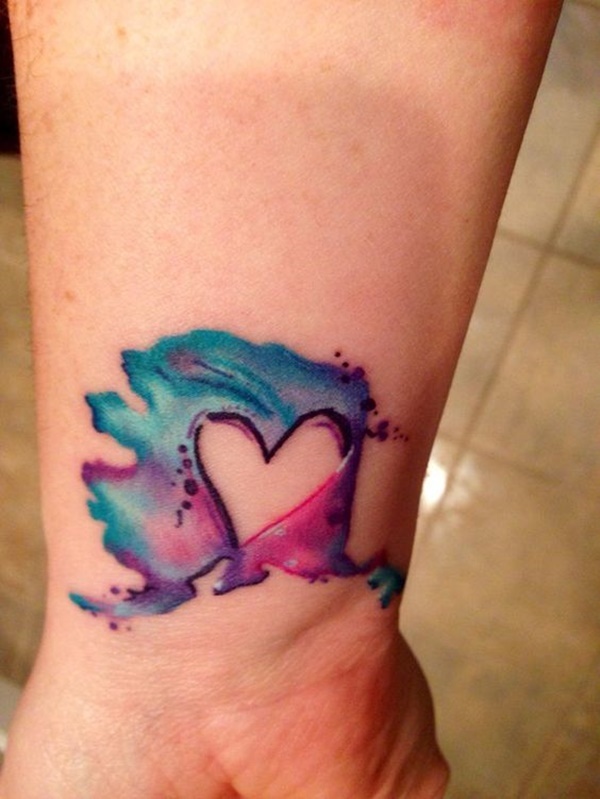 A heart is created using negative space inside of a blue, purple, and pink watercolor smear. 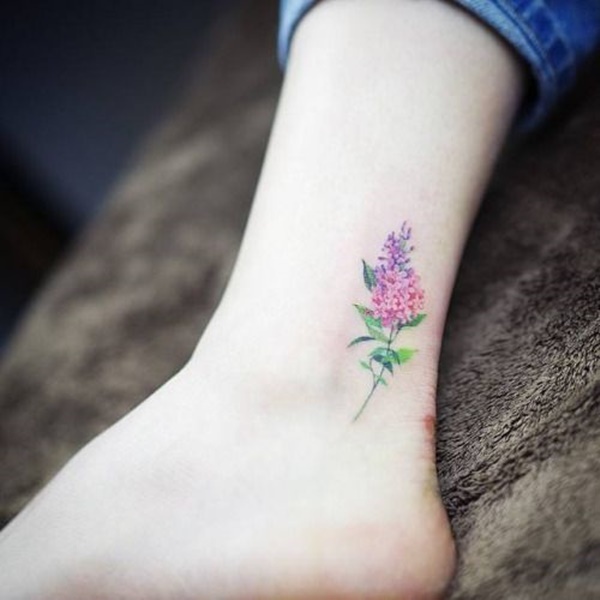 A colorful, hyper-realistic flower is depicted on the wearer’s ankle. 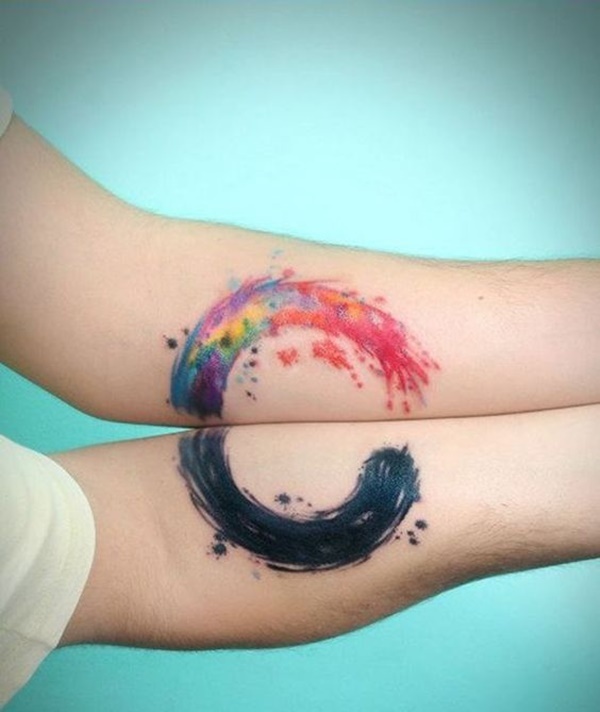 A multi-colored circular half is depicted on one wearer’s forearm while a black circular half is depicted on the other wearer’s forearm. 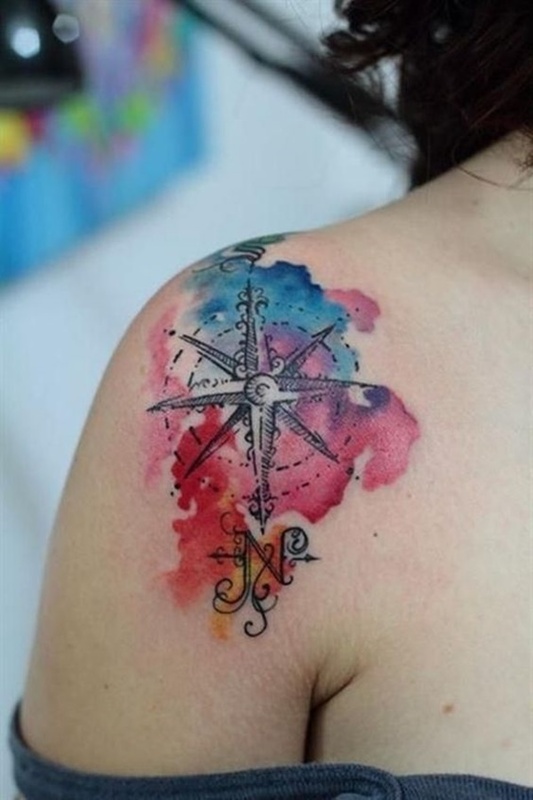 A watercolor smear functions as the background of this tattoo featuring a compass and roman numerals commemorating the date of the February 16th, 1989. 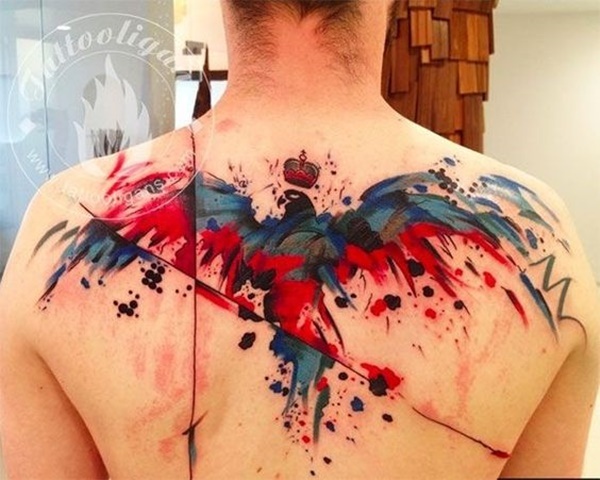 An abstract blue and red eagle is portrayed with spread wings and a crown hovering above its head in this back tattoo. 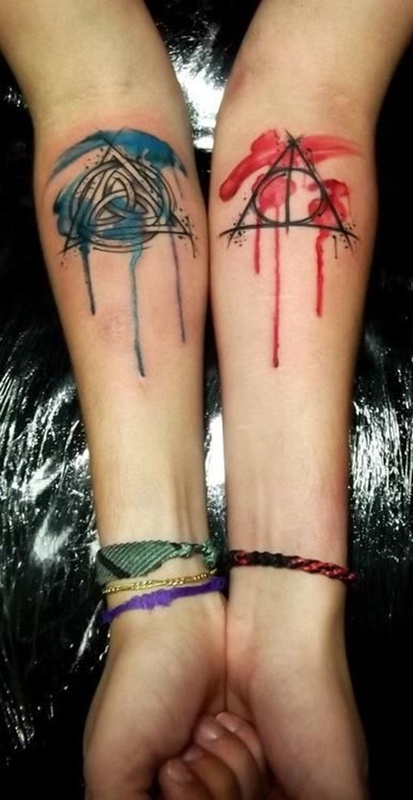 A Celtic knot inside of a triangle is accented with blue watercolors on one forearm while the symbol for the Deathly Hallows from Harry Potter is accented with red watercolors is illustrated on the other forearm. 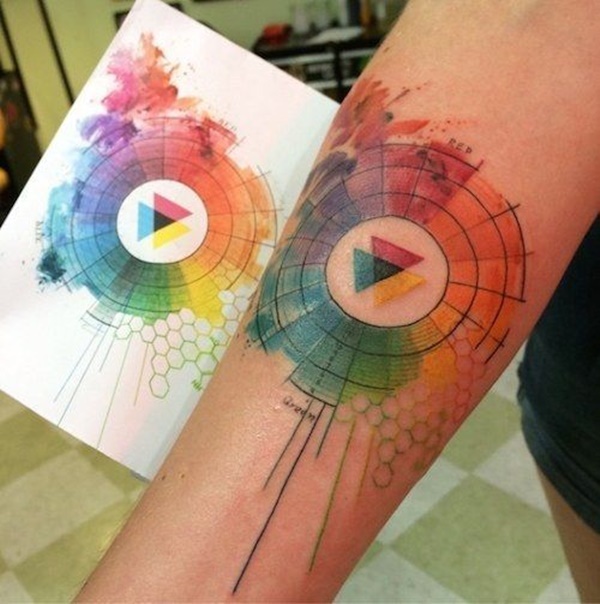 A circle containing three overlapping triangles trails off into a honeycomb pattern in this colorful tattoo. 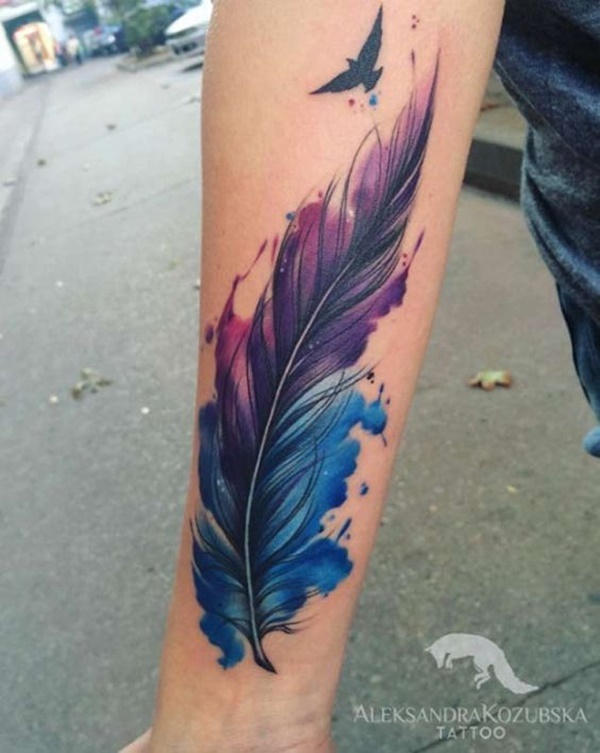 A bird silhouette accompanies a blue and purple feather in this forearm tattoo. 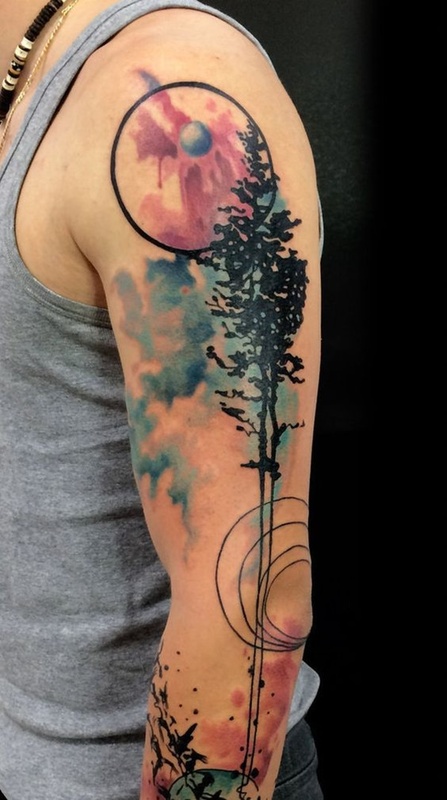 The trunk of a barren tree separates the colorless side of the piece and the colored side of the piece in this forearm tattoo. 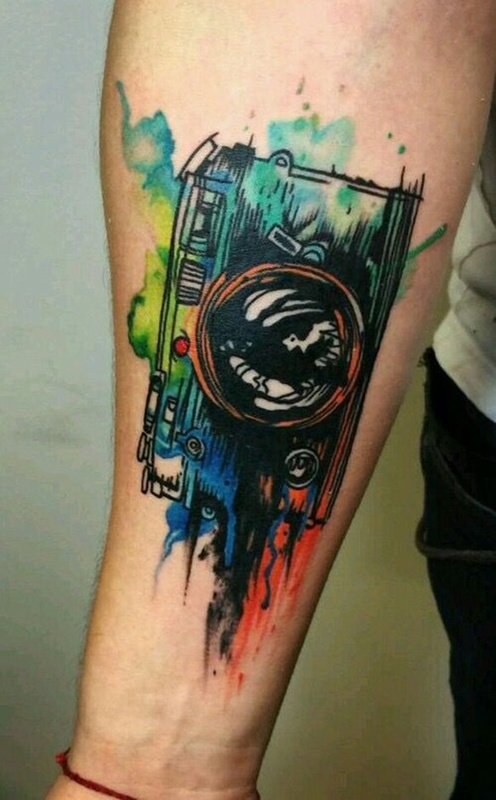 An analog camera is embellished with watercolor smears. 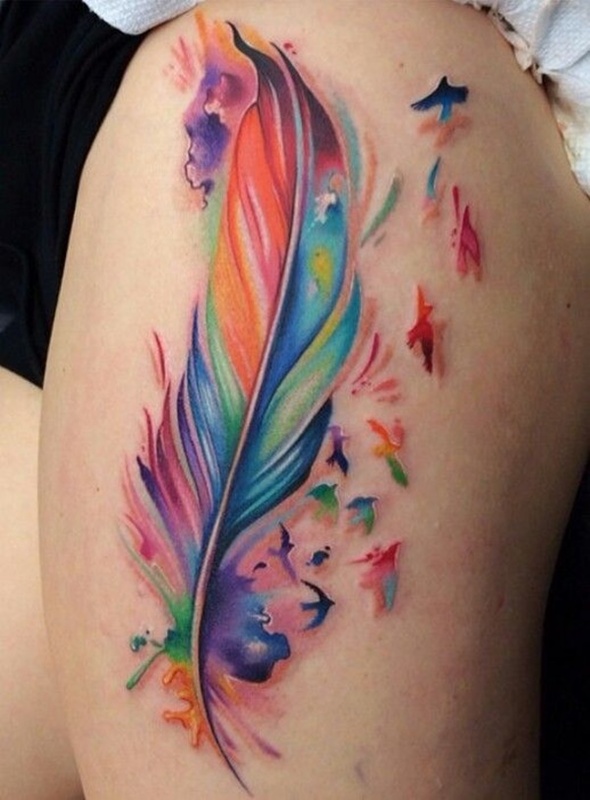 A series of colorful bird silhouettes surround a multi-colored feather. 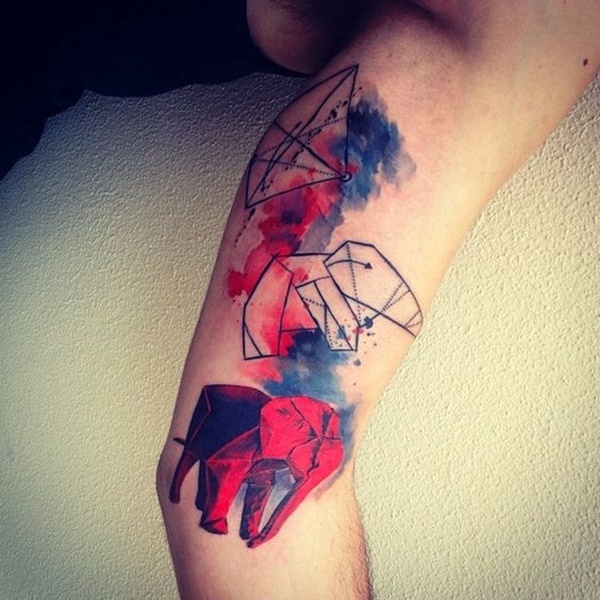 The multiple folding stages of an origami elephant are depicted with black and red coloring. 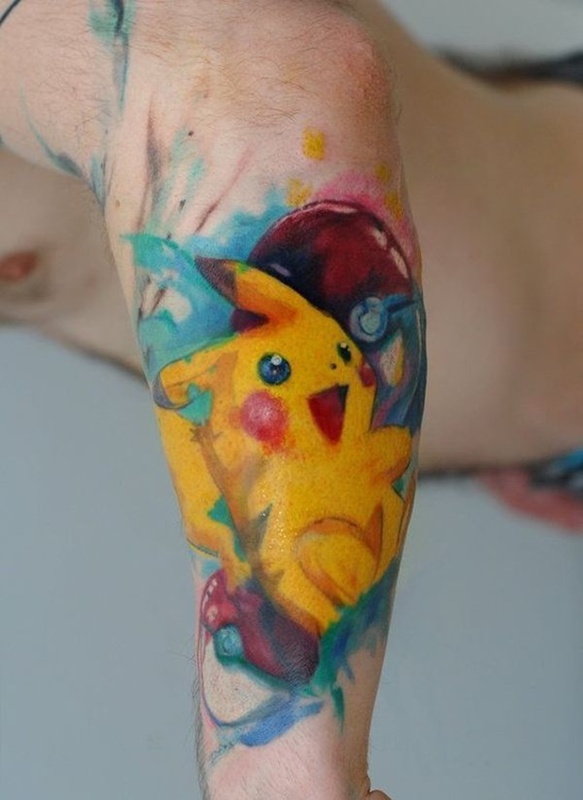 A joyous Pikachu is accompanied by pokeballs and depicted over a blue background. 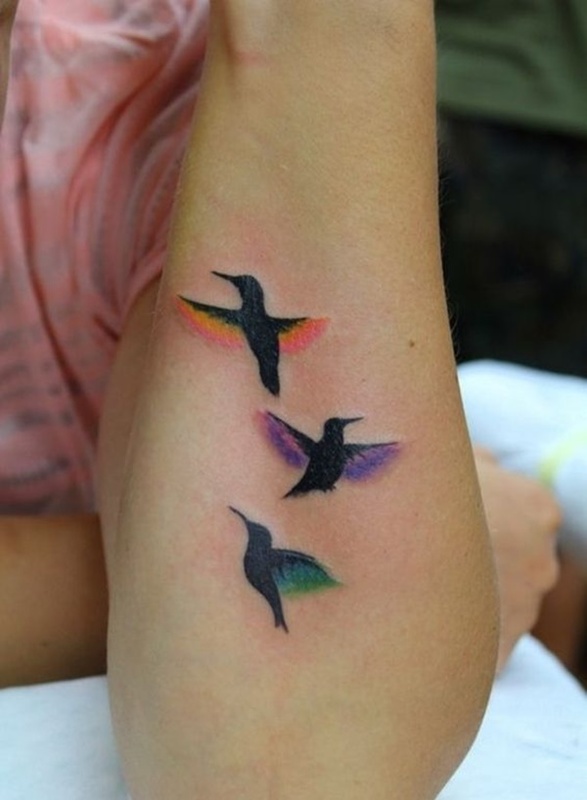 Three hummingbird silhouettes are depicted with different colors accenting the birds’ wings. 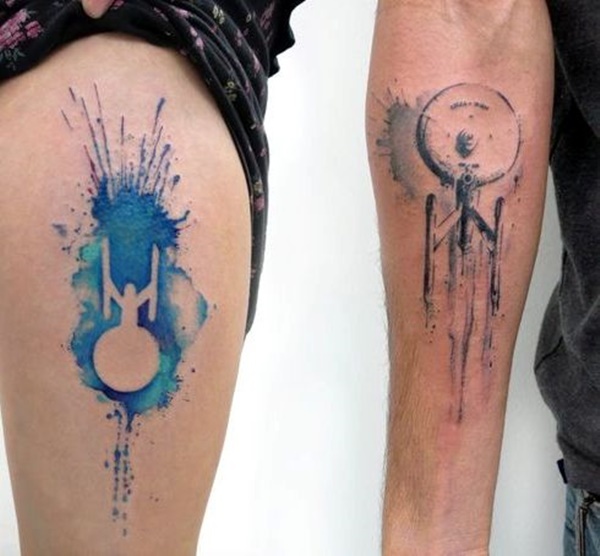 The Starship Enterprise is depicted in blue watercolors in one piece and black watercolors on the other. This abstract piece portrays a ballerina in the foreground while abstract watercolor smears and linework create the background. 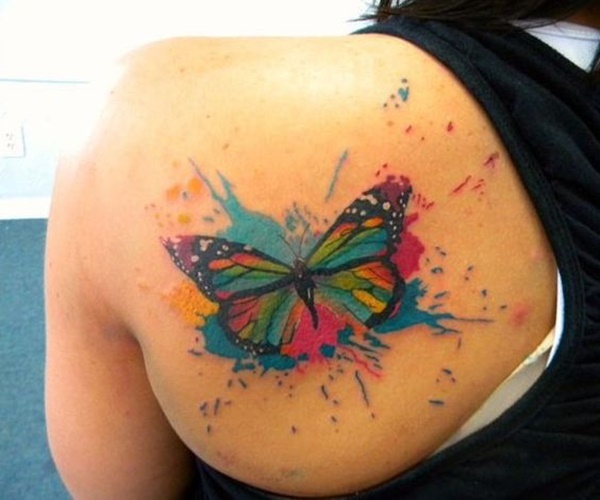 A multi-colored butterfly is depicted over a multi-colored watercolor smear. 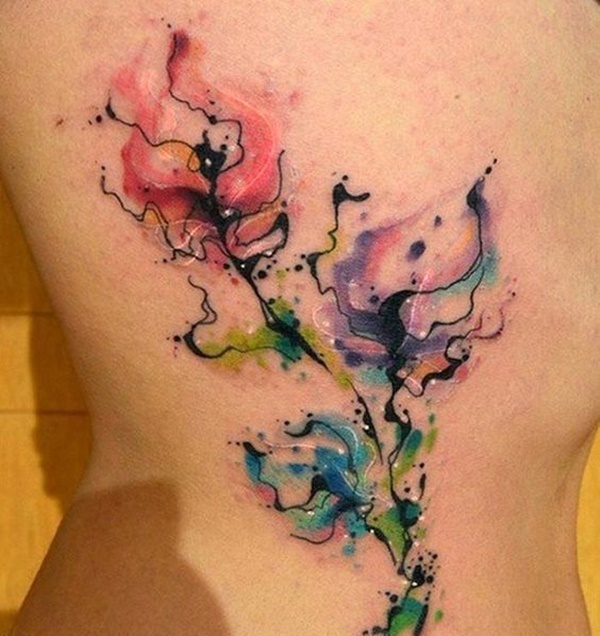 Three flowers are created using a very delicate distribution of watercolors. A multi-colored peacock is depicted on the wearer’s chest. 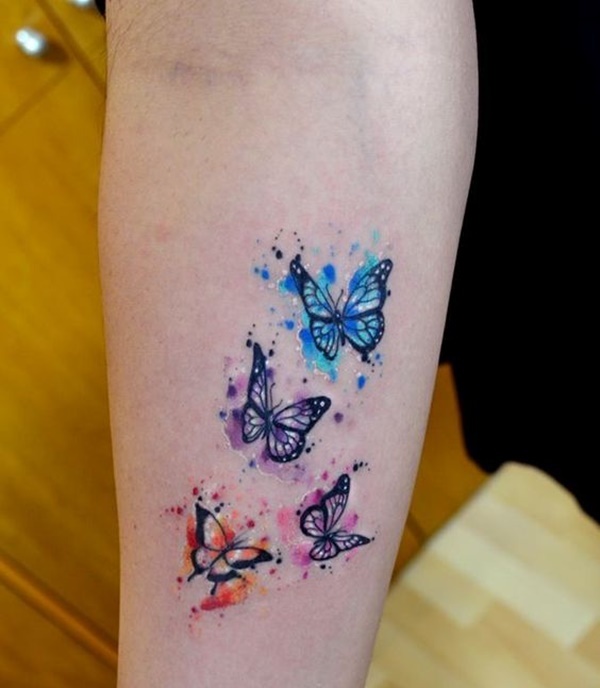 Four butterflies are depicted in flight and each is given a different embellishing color. 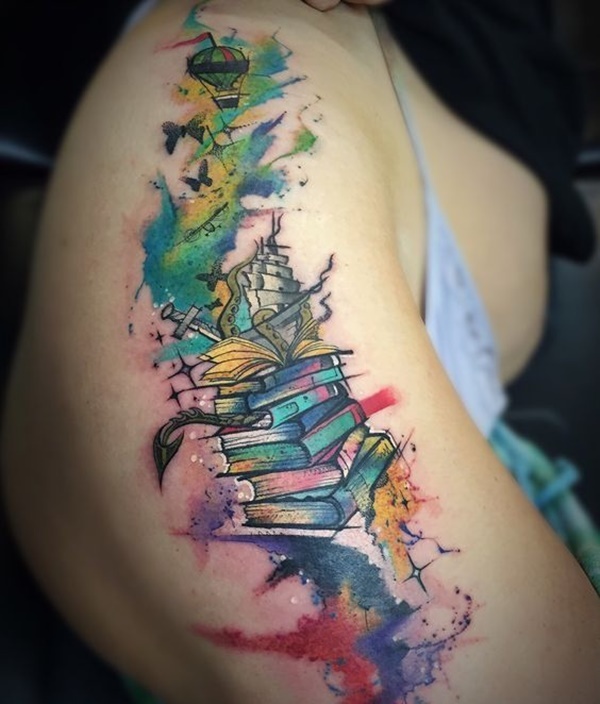 A stack of books is accompanied by a plethora of other images including a hot air balloon, butterflies, a ship, and a dragon tail. 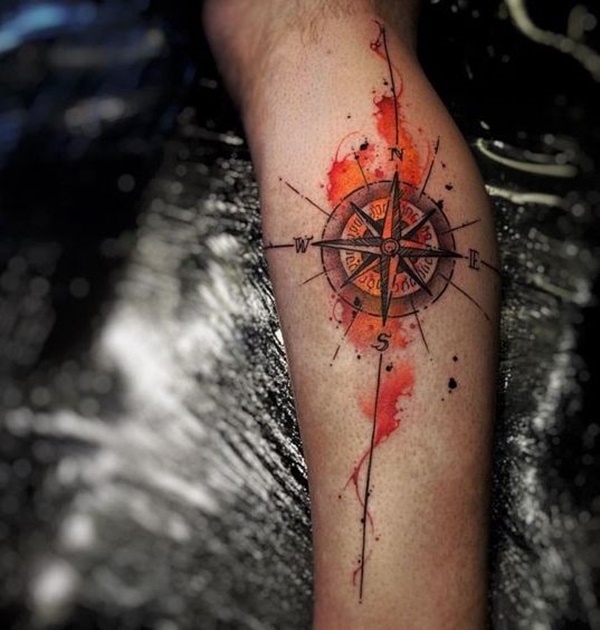 A compass is rendered over an orange watercolor smear. 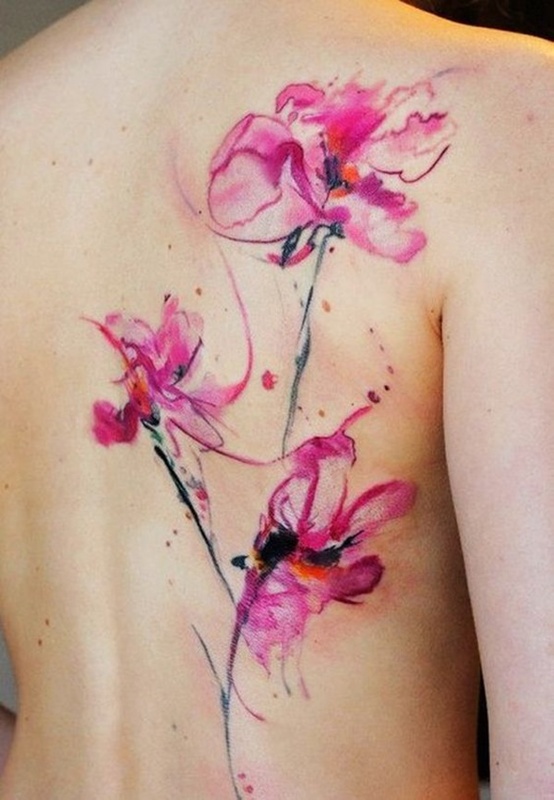 Three pink flowers are depicted on the wearer’s back. 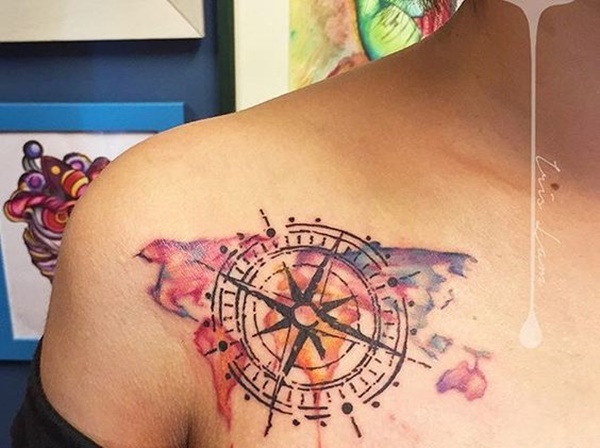 A compass is portrayed over a watercolor depiction of a world map. 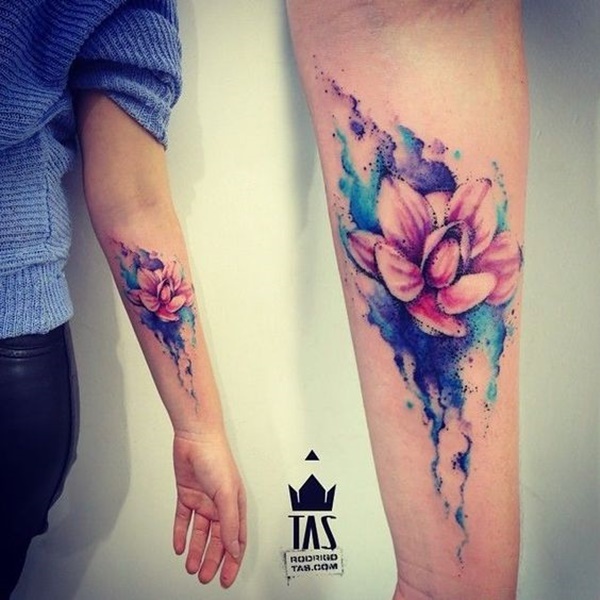 A pink lotus is depicted over a blue and purple watercolor smear. 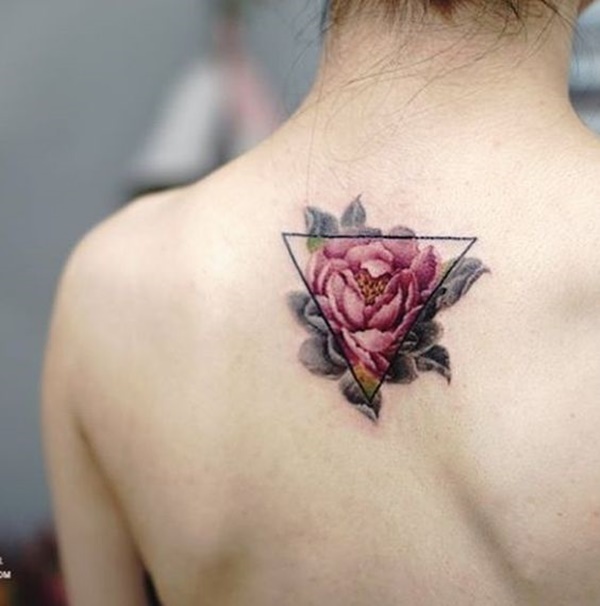 A triangle sits atop a flower in this tattoo. 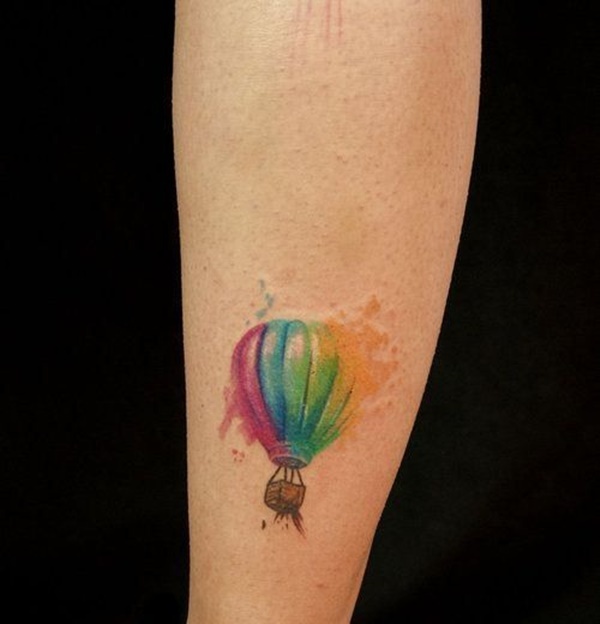 A hot air balloon is depicted with a multi-color balloon. 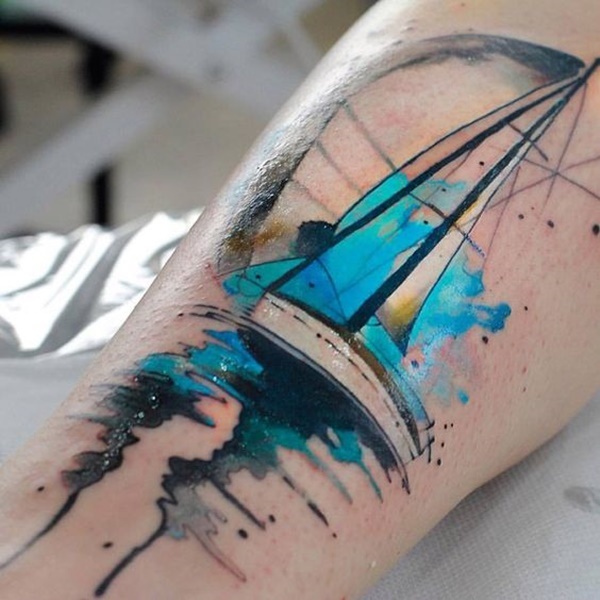 A sailboat is embellished with bright blue watercolors in this impeccably well done tattoo. 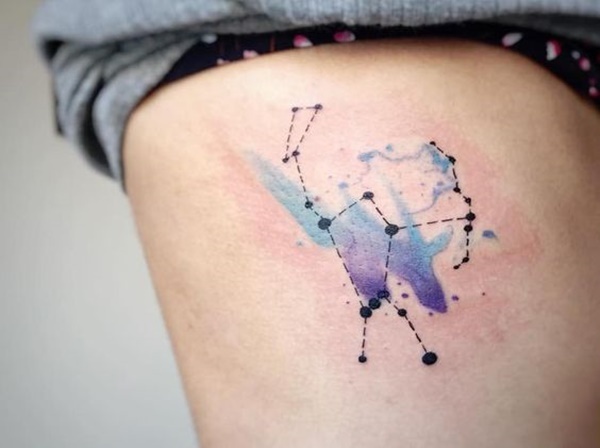 The constellation Orion is represented over a blue and purple watercolor smear. 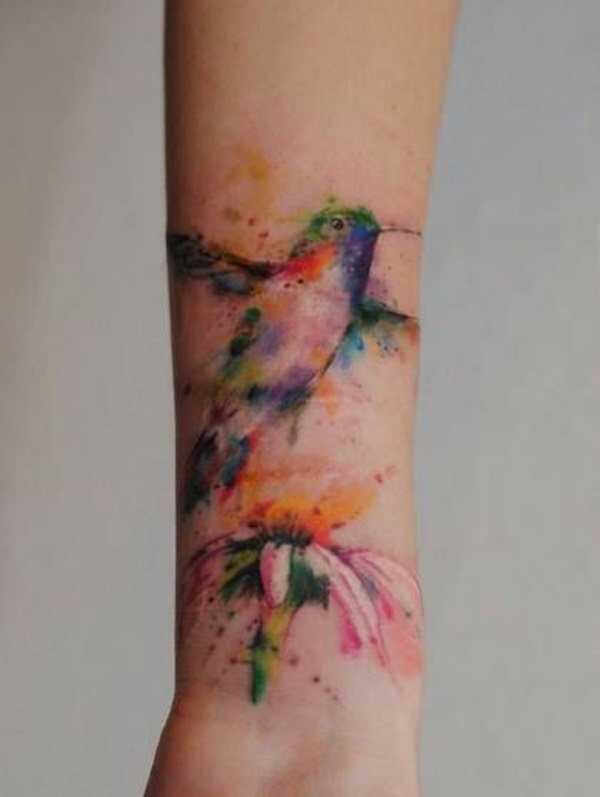 A hummingbird is depicted hovering over a flower in this exceptionally colorful tattoo. 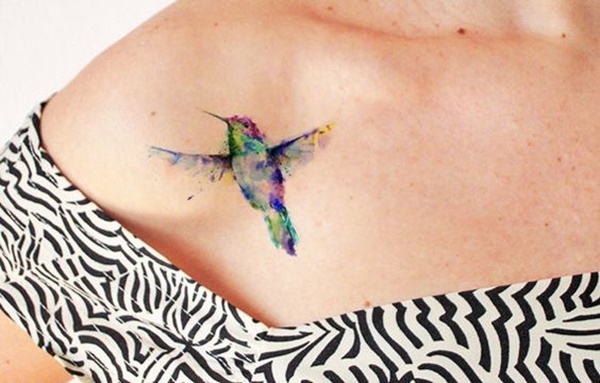 Colorful depictions of a hummingbird and a sparrow are shown in this photo. 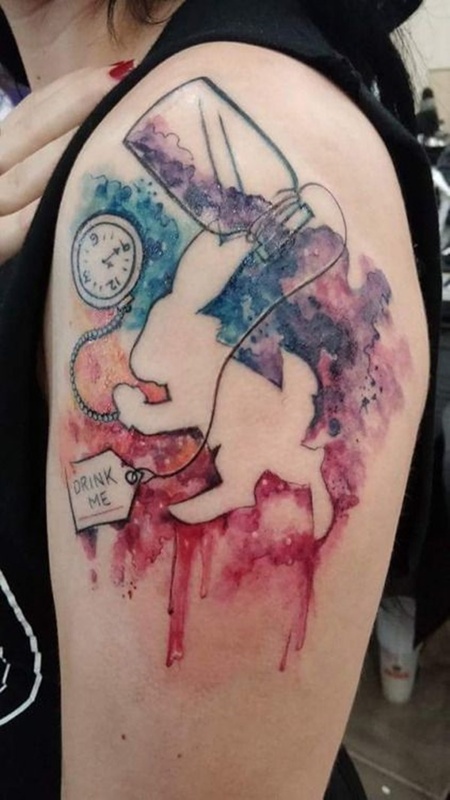 The outline of the White Rabbit from Alice in Wonderland is depicted in negative space inside of a watercolor smear. The outline is accompanied by a glass bottle and a pocket watch. 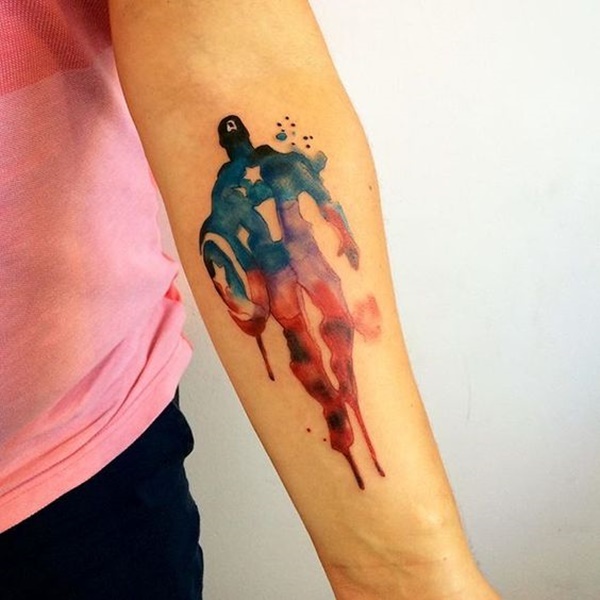 Blue and red watercolors compose an image of Captain America in this forearm tattoo. 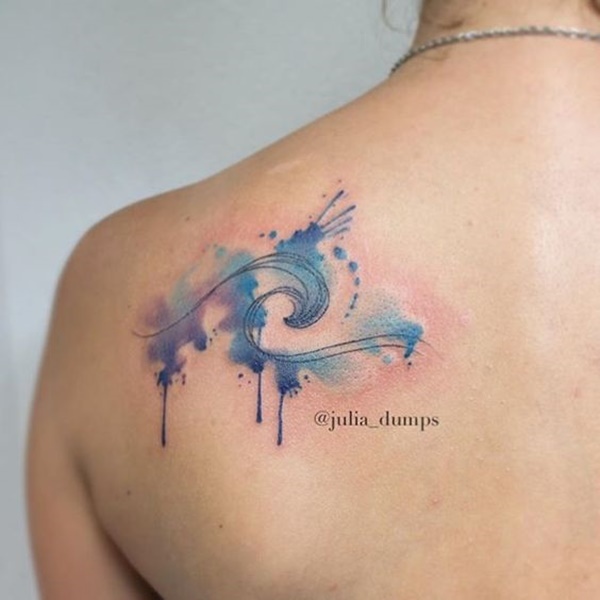 A cresting wave is embellished with blue and purple watercolor smears in this tattoo. 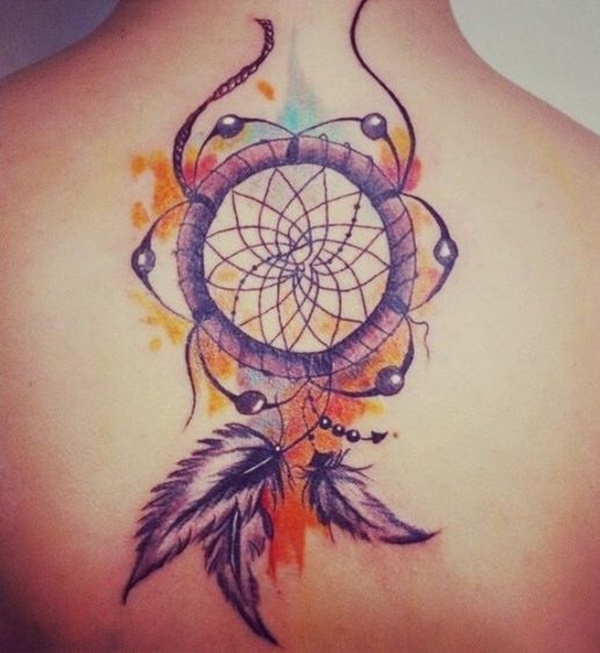 A purple dreamcatcher adorned with flowers is rendered over yellow and orange watercolor smears. 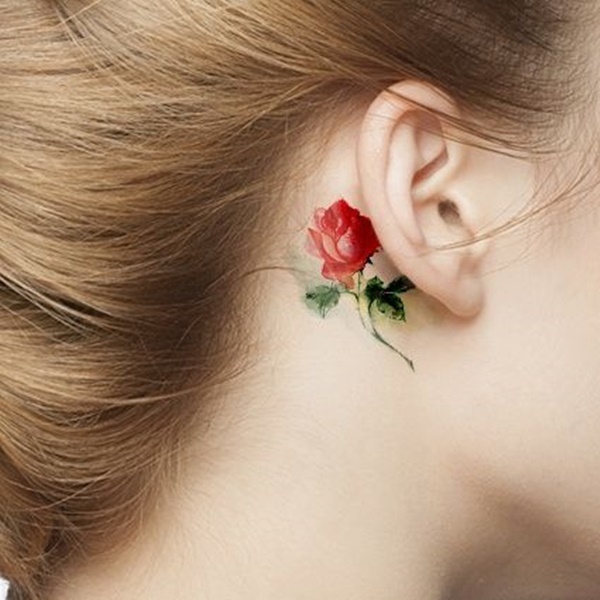 A small red rose is illustrated behind the wearer’s right ear. 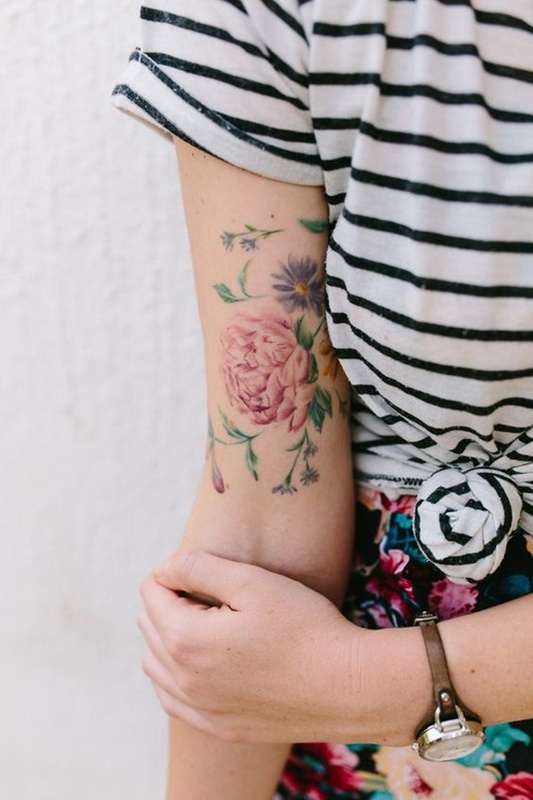 A myriad of flowers is depicted on the wearer’s upper arm. 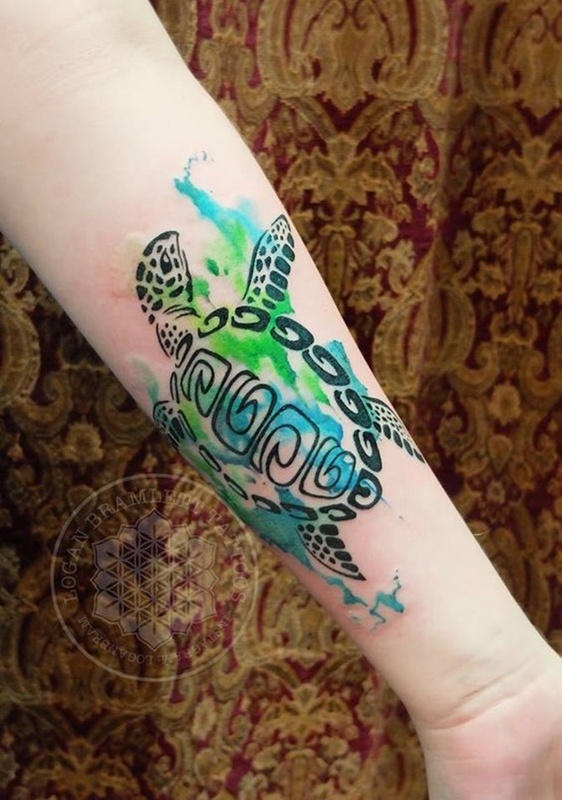 A sea turtle is created using tribal designs and is accented with blue and green watercolor smears. 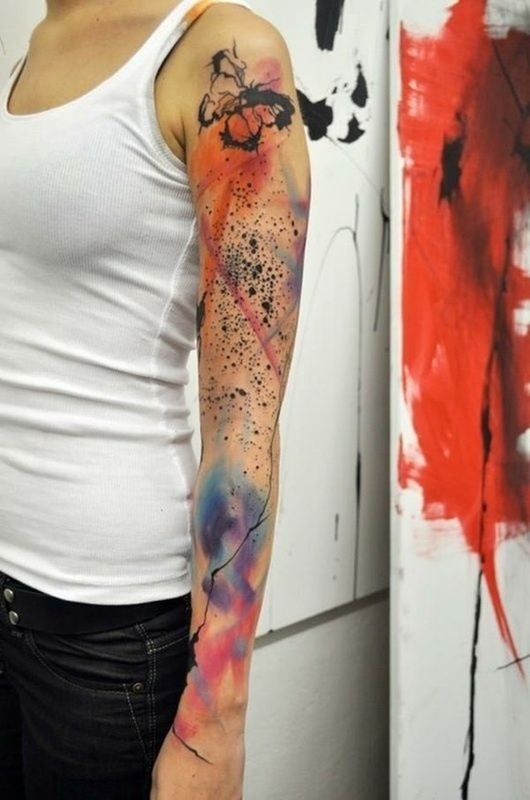 An arrow composed of shaky watercolor lines is embellished with watercolor smears and runs along the wearer’s right forearm. 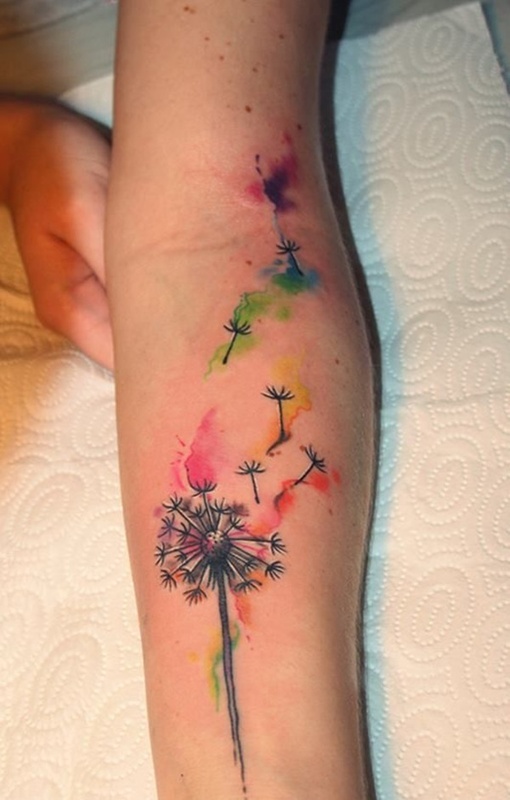 A dandelion is depicted with its seeds blowing into the wind and is embellished with multiple watercolors. 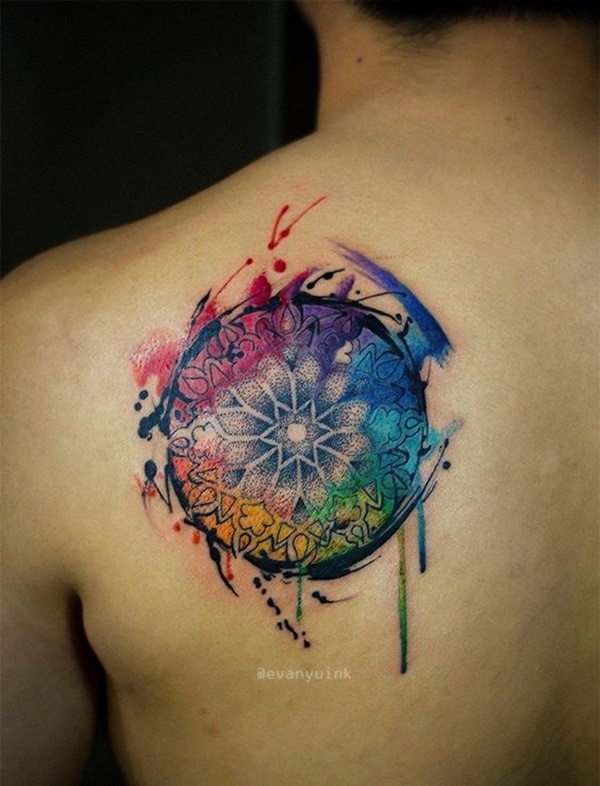 A varied palette of watercolors is used to accent a mandala. 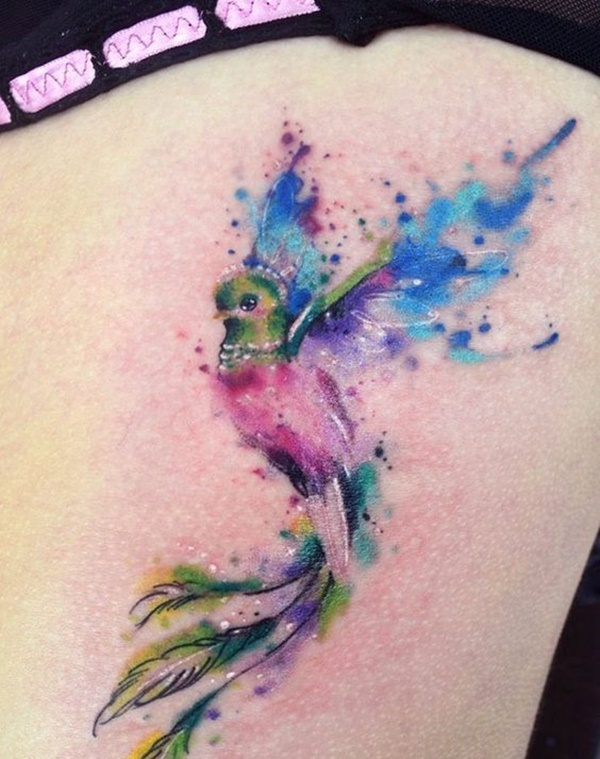 A stylized depiction of a bird is shown in this beautifully done tattoo. A tree with an exceptionally long trunk is shown leading to a circle containing celestial bodies. 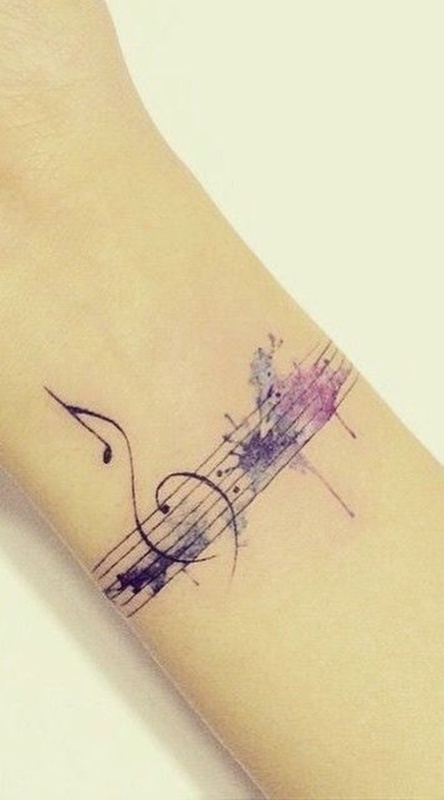 This tattoo would be a daunting task for any artist. 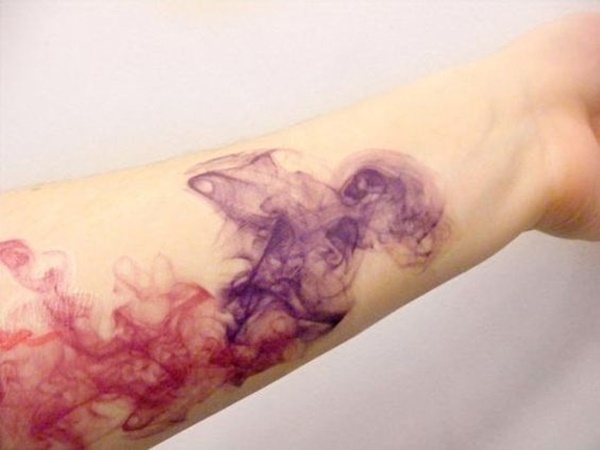 Despite the difficulty of the piece this tattoo is incredibly well done and shows a plume of smoke colored in pink and purple. A tree with a solid black trunk sports multi-colored foliage. 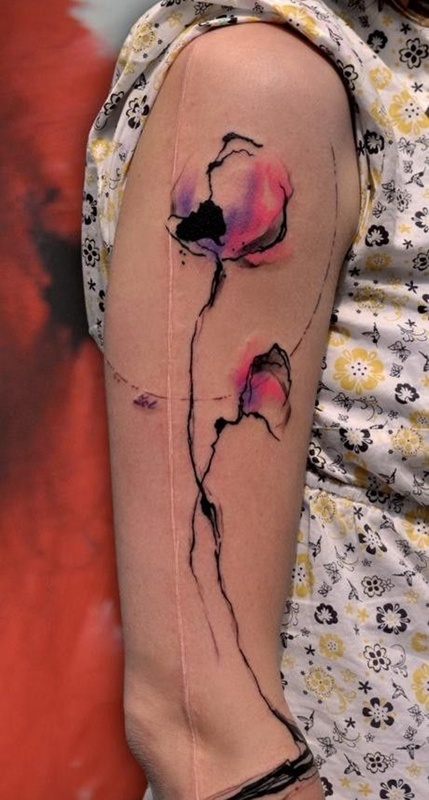 A minimalist depiction of flowers is created using thick black lines and soft coloring in the bulbs of the flowers.